Maintenance of a quiescent and organotypically-differentiated layer of blood vessel-lining endothelial cells (EC) is vital for human health. Yet, the molecular mechanisms of vascular quiescence remain largely elusive. Here we identify the genome-wide transcriptomic program controlling the acquisition of quiescence by comparing lung EC of infant and adult mice, revealing a prominent regulation of TGFß family members. These transcriptomic changes are distinctly accompanied by epigenetic modifications, measured at single CpG resolution. Gain of DNA methylation affects developmental pathways, including NOTCH signaling. Conversely, loss of DNA methylation preferentially occurs in intragenic clusters affecting intronic enhancer regions of genes involved in TGFβ family signaling. Functional experiments prototypically validated the strongly epigenetically regulated inhibitors of TGFβ family signaling SMAD6 and SMAD7 as regulators of EC quiescence. These data establish the transcriptional and epigenetic landscape of vascular quiescence that will serve as a foundation for further mechanistic studies of vascular homeostasis and disease-associated activation. The vascular system is made up of vessels including arteries, capillaries and veins that carry blood throughout the body. The inner surfaces of these blood vessels are lined with a thin layer of cells, called endothelial cells, which form a barrier and a communicating interface between the circulation and the surrounding tissue. Early in an organism’s life, when the vascular system is still growing, endothelial cells increase in number by dividing into more cells. In adulthood, as the vascular system reaches its full size, the endothelial cells maintain a stable number. As a result, an adult’s vascular system has a resting layer of endothelial cells that does not divide. This is known as vascular quiescence, and scientists know little about how the body achieves and maintains it. To unravel the mechanisms controlling vascular quiescence, Schlereth et al. studied endothelial cells taken from blood vessels in the lungs of newborn and adult mice. By comparing all the genes present at both developmental stages, the changes of gene activity in these cells could be measured. The results showed that the activity of genes strongly correlated with so called epigenetic changes in the genes involved in vascular quiescence. These are DNA modifications that can alter the function of a gene without affecting its underlying sequence. Two genes in particular (Smad6 and Smad7) appeared to play an important role in vascular quiescence. Their corresponding proteins, SMAD6 and SMAD7, inhibit another group of proteins (TGFβ family) important for cell growth. The results showed that the endothelial cells in adult mice produced more SMAD6 and SMAD7 than in young mice. Therefore, endothelial cells of adult mice stop to increase in number and to migrate. For the first time ever, Schlereth et al. have provided an extensive comparative analysis of gene activity and epigenetic changes to study vascular quiescence. The findings open a new chapter of vascular biology and will serve as a foundation for future research into the mechanisms of vascular quiescence. Problems in maintaining a resting layer of cells may lead to vascular dysfunction, which is associated with a wide range of diseases, such as stroke, heart disease and cancer making it a leading cause of death. In future, scientists may be able to develop new treatments that target specific molecules to help the body achieve a resting blood vessel system. Endothelial cells (EC) are long-lived cells of the mesodermal lineage that line the inside of all blood vessels forming a single layer of organotypically-differentiated cells (Augustin and Koh, 2017; Deanfield et al., 2007; Rafii et al., 2016; Regan and Aird, 2012). Unlike unidirectional differentiation programs of short-lived epithelial cells, EC acquire a quiescent state during the transition to adulthood from which they can switch back to the activated phenotype resulting in disease-associated angiogenesis (Hobson and Denekamp, 1984; Marcelo et al., 2013). In fact, the maintenance of the quiescent vascular phenotype is of pivotal importance for human health. Loss of this EC phenotype is a hallmark of vascular dysfunction and a commonality of diverse life-threatening diseases ranging from sepsis, atherosclerosis to cancer (Carmeliet and Jain, 2011; Gimbrone and García-Cardeña, 2016). Likewise, major and socioeconomically important chronic diseases are characterized by a loss of the quiescent EC phenotype, like age-dependent macular degeneration and diabetic retinopathy. Vascular targeted therapies for such conditions are mostly aimed at interfering with EC activation programs (Krzystolik et al., 2002; Tanabe et al., 2017). Therefore, it is crucial to get a better understanding of the pathways involved in acquisition of vascular quiescence to improve vessel targeted therapies. While the mechanisms of sprouting angiogenesis, network formation and remodeling have been molecularly unraveled in increasing detail, the molecular mechanisms of acquisition of EC quiescence are still poorly understood (Adams and Alitalo, 2007; Herbert and Stainier, 2011; Jain, 2003; Korn and Augustin, 2015). EC quiescence is an active process, as it not only involves the absence of activators but also microenvironmental factors as well as cell intrinsic mechanisms. Matricellular factors, contact with pericytes and hemodynamic forces act as microenvironmental determinants of vascular maturation (Armulik et al., 2011; Baeyens et al., 2016; Davis et al., 2015; Stratman et al., 2017; Yousif et al., 2013). To switch from an activated to a resting phenotype, numerous signaling pathways in EC including VEGF, NOTCH, FGF, TGFβ, angiopoietin and semaphorin signaling need to be properly regulated (Marcelo et al., 2013; Patel-Hett and D'Amore, 2011). To add another layer of complexity, there is an intricate crosstalk between these pathways and their integration is not completely understood (Ehling et al., 2013; Holderfield and Hughes, 2008; Kim et al., 2011). Furthermore, while some pathways are described to have clear pro- or anti-angiogenic effects, the impact of other signaling pathways is rather contextual or even still controversially discussed. For instance, TGFß family signaling has been described to exert both, pro-and anti-angiogenic functions and to contextually cooperate with NOTCH signaling in the regulation of angiogenesis (Cai et al., 2012; Dyer et al., 2014; Goumans et al., 2003; Goumans et al., 2002; Larrivée et al., 2012; Mallet et al., 2006; Mouillesseaux et al., 2016; Suzuki et al., 2008). Thus, better molecular understanding of the way crucial EC-associated signaling pathways are regulated during the post-angiogenic acquisition of vessel quiescence will yield better mechanistic insights into vascular function during health and disease. The mechanisms of EC activation during health and disease have been studied in substantial detail on the expression level of individual genes or pathways as well as genome-wide, for example genome-wide screens of regulators of angiogenesis or inflammation (Cannon et al., 2013; del Toro et al., 2010; Massaro et al., 2015; Zhang et al., 2012). Yet, no unbiased genome-wide systems biological effort from in vivo isolated EC has been made so far to identify the transcriptomic signatures associated with the acquisition and maintenance of EC quiescence. DNA methylation acts in concert with other epigenetic marks in defining chromatin states which create gene active and silenced compartments in the genome (Jones, 2012; Soshnev et al., 2016). Moreover, considering the increasingly recognized important roles of epigenetic alterations in the control of cellular differentiation processes (Boland et al., 2014; Cabezas-Wallscheid et al., 2014; Lipka et al., 2014), crucial molecular mediators of vessel maturation and EC quiescence may also be regulated by epigenetic mechanisms, which in EC have similarly not been studied in an unbiased genome-wide approach. The present study consequently aimed at obtaining and comparing transcriptomic and epigenomic signatures of EC from infant and young adult mice in order to identify most prominently regulated signaling pathways of vascular quiescence. 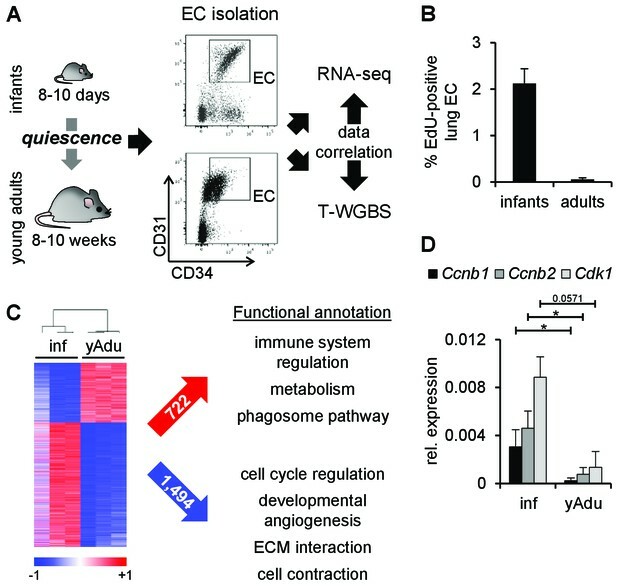 To identify factors and pathways regulated during acquisition of endothelial cell (EC) quiescence in an unbiased genome-wide manner, RNA-seq from freshly FACS-sorted lung EC isolated from infant (p8-p10) and adult mice (8–12 weeks) was performed (Figure 1A and Figure 1—figure supplement 1A). The purity of cell sorting was controlled by the validation of marker gene expression (Figure 1—figure supplement 1B). The phenotypic shift in marker expression (CD31/PECAM1 and CD34) between infant and young adult EC reflected the size of the corresponding EC (Figure 1—figure supplement 1C). EdU incorporation assays verified the almost complete arrest of cell proliferation in adult EC (Figure 1B and Figure 1—figure supplement 1D). Comparative transcriptome analysis identified 2,216 differentially expressed genes with pronounced regulation of genes mediating the induction of immune mechanisms, metabolism and phagosome pathways as well as the repression of genes controlling cell cycle, developmental angiogenesis, extracellular matrix interactions and cell contraction (Reactome-based analysis) (Figure 1C). To gain further insight into the mechanisms of EC quiescence, the protein interaction network (interactome) of the differentially regulated genes was generated (Figure 1—figure supplement 2A). The analysis of this interactome led to the identification of several pathways presumably relevant during the acquisition of EC quiescence (Figure 1—source data 1). Importantly, it resulted in further specification of immune system regulation, as JAK-STAT signaling was most significantly enriched (p=5.7×10-11) in an EC quiescence network with most factors being induced, putatively mediating the repression of the pro-angiogenic growth factors Fgf7 and Fgf10 (Figure 1—figure supplement 2B and Figure 1—source data 1). Further network clustering identified densely connected protein communities within the interactome (Figure 1—figure supplement 2C). Functional annotation of the genes within each cluster revealed unique (SEMA, TGFB and ERBB signaling) enriched biological functions compared to Reactome-based analysis. Altogether, interactome analysis confirmed and extended the functional annotation of the genes differentially regulated during acquisition of EC quiescence. Transcriptomic changes of endothelial cells during acquisition of quiescence. (A) Scheme depicting the workflow of lung EC isolation by FACS from infant (inf) and young adult (yAdu) mice followed by transcriptome profiling by RNA-sequencing and DNA methylome analysis by tagmentation-based WGBS (T-WGBS). Shown are representative FACS profiles for the two different endothelial cell populations. (B) Analysis of lung EC proliferation in vivo by EdU assay. EdU was injected i.p. and lung EC were analyzed by FACS 17 hr later. n = 3; mean ± SD. (C) Hierarchical clustering of differentially expressed genes and functional annotation by Reactome overlap analysis of the 722 induced and 1,494 repressed genes regulated during the acquisition of EC quiescence. (D) Validation of the differential expression of cell cycle genes in infant and young adult lung EC using qPCR. n ≥ 3; mean ± SD; *p<0.05; Mann-Whitney Test. In line with the EdU assays, prominent regulators of cell cycle arrest were validated to be down-regulated during acquisition of EC quiescence in lung EC (Figure 1D and Figure 1—source data 2) as well as in brain and heart EC (Figure 1—figure supplement 1E). Altogether, these data suggest that the comparison of the transcriptomic profile of infant and adult EC displayed valid quiescence-dependent changes. Corresponding to the arrest of EC proliferation, the transcriptomic screen identified distinct changes of angiogenic molecule expression. Sixteen pro-angiogenic molecules were down-regulated and eight anti-angiogenic molecules were up-regulated during acquisition of vascular quiescence (Figure 2A). This involved the downregulation of angiogenic signal transducing cell surface receptors (Tgfbr2, Bmpr1, Notch3 and Fgfr1) as well as the upregulation of quiescence signal transducing receptors, most notably Cd36 and the angiopoietin receptor Tek (encoding for Tie2 protein), probably the functionally best characterized maturation receptor of EC (Augustin et al., 2009). Several autocrine and paracrine acting secreted angiogenic molecules were identified as differentially expressed: up-regulation of the semaphorins Sema3C and Sema3G as well as thrombomodulin (Thbd) and downregulation of Fgf7, Fgf10, placental growth factor (Pgf) and Wnt5a. Comparative quantitative PCR (qPCR) of selected candidate molecules validated gene expression changes identified by RNA-seq confirming the high robustness of the sequencing data (Figure 2B and Figure 2—figure supplement 1A). TGFß family signaling is inhibited in quiescent EC. (A) Heatmap depicting the expression of anti- and pro-angiogenic molecules during the acquisition of vascular quiescence. Depicted are significantly regulated genes (p<0.05) that are differentially expressed by at least 1.75 fold. (B) Validation of the expression pattern of anti- and pro-angiogenic molecules in lung EC by qPCR in independent biological samples. n ≥ 3; mean ±SD; *p<0.05; Mann-Whitney Test. (C) Schematic representation of the regulation of TGFβ family signaling molecules during acquisition of vascular quiescence emphasizing the overall inhibition of this pathway. Shown by color-code is the gene regulation of individual TGFβ family pathway members (red, upregulated; blue, downregulated; log2FC: log2 fold change). Ltbp: latent TGF-beta binding protein; Bmpr1a: Bone Morphogenetic Protein Receptor Type 1A/Alk3; Bmpr2: Bone Morphogenetic Protein Receptor Type 2; Tgfbr2: Transforming Growth Factor Beta Receptor 2; Tgfbr1: Transforming Growth Factor Beta Receptor 1/Alk5; Smad6 and Smad7: inhibitory SMADs; Smad1/5/8 and Smad2/3: receptor-regulated SMADs; Smad4: Co-SMAD; Col1a: TGFß target gene Collagen type I alpha. (D) Upstream growth factor analysis with activation state prediction of all differentially expressed genes during transition to EC quiescence. Depicted are the transformed (-log10) p-value and the predicted activation state (z-score) of the upstream growth factor according to Ingenuity Pathway Analysis. See methods section for further details. The following figure supplements are available for Figure 2. Among these angiogenesis-regulating molecules, the TGFβ pathway was identified as the most concordantly downregulated signaling pathway with repression of matrix-associated latent TGFβ-binding proteins (Ltbp2, Ltbp3, Ltbp4) and receptors (Tgfbr2, Bmpr1) as well as upregulation of the inhibitory Smads, Smad6 and Smad7 (Figure 2C). Correspondingly, upstream analysis of the complete set of differentially expressed genes including activation state prediction of the corresponding upstream regulator revealed TGFß1 as the most significantly inhibited growth factor (Figure 2D). Collectively, the data uncovered complex transcriptional changes of angiogenic molecules governing EC quiescence. They highlight a series of pathways that have all been associated with EC activation, most notably the TGFβ pathway. To assess the impact of epigenetic remodeling in the vascular system during acquisition of vascular quiescence, we analyzed the expression of chromatin modifying enzymes (CME) (Plass et al., 2013). About 10% of CMEs were differentially expressed with the majority being repressed in adult EC (Figure 2—figure supplement 1B and C), including the de novo DNA methyltransferase Dnmt3a and four additional DNA methylation modifiers (Gadd45a, Tet1, Fos, Uhrf1) (Figure 2—figure supplement 1D). This suggested that the patterns of DNA methylation were more dynamic in infant compared to adult EC. It is now accepted that the DNA methylome gives a precise picture of the epigenetic state, defining active and inactive regions within genomes (Cabezas-Wallscheid et al., 2014; Jones, 2012; Lipka et al., 2014; Soshnev et al., 2016). Consequently, tagmentation-based whole genome bisulfite sequencing (T-WGBS) of biological triplicates of infant and young adult EC samples enabled the identification of quiescence-dependent DNA methylation changes at single CpG nucleotide resolution (Figure 1A and Figure 3—figure supplement 1A). T-WGBS data were highly reproducible in MassARRAY using independent biological replicates (Figure 3—figure supplement 1B and C). Bioinformatic analysis revealed a significant increase of CpGs with >80% methylation level in adult EC compared to infant EC (p=6.87×10−6) demonstrating a global increase in CpG methylation during the transition to vascular quiescence (Figure 3A). In total, DNA methylation changes resulted in more than 1.4M differentially methylated CpGs (DMCs). Retaining only the consecutive DMCs (68,184) with a 10% methylation difference showed a significant intragenic enrichment (Figure 3—figure supplement 1D). These DMCs gave rise to 18,333 differentially methylated regions (DMRs) (Figure 3B). The distribution of methylation differences among the DMRs demonstrated a more prominent loss (20–60% methylation difference between infants and young adult) than gain of methylation (10–40% methylation difference) (Figure 3C). Applying a threshold of 10% methylation difference, young adults acquired a gain of methylation in 54% of DMRs and a loss of methylation in 46% of DMRs during acquisition of quiescence (20% gain and 80% loss, respectively, when applying 30% as threshold) (Figure 3B). Both, loss and gain of methylation DMRs were depleted on transcription start sites (TSS), but enriched up- and downstream (10–100 kb distant) from the TSS (Figure 3D). There was an overall significant enrichment of DMRs in introns (OR 2.65, p<0.0001), most prominent in intron 1–3 of a given gene (Figure 3E and Figure 3—figure supplement 1E). Notably, hypomethylated DMRs were overrepresented in introns and underrepresented in intergenic regions (Figure 3—figure supplement 1F). Overlap of the DMRs with lung-identified genomic regulatory features (Shen et al., 2012; Yue et al., 2014) further specified the DMRs to coincide with putative enhancer regions (H3K4me1 positive regions, enhancer-promoter units [EPU], DNase hypersensitive regions) but not with transcription start sites (CpG islands, TSS defined by FANTOM consortium, H3K4me3 positive regions) (Figure 3F). This could be visualized in an exemplary way in genome browser views depicting CpG islands and putative enhancer regions together with the identified DMRs (Figure 3G and Figure 4E). Essentially, DNA methylation profiling suggested a prominent loss of methylation at intronic enhancers during acquisition of quiescence in lung EC. Vascular quiescence is accompanied by a prominent loss of DNA methylation at intronic enhancer regions. (A, B) Data of tagmentation-based WGBS of infant and young adult lung EC were analyzed on the level of single CpGs (A) and differentially methylated regions (DMRs) (B). (C) Distribution of the methylation difference (in %) of DMRs during the acquisition of EC quiescence. Depicted are all changes ≥ 10% between young adult and infant EC. (D) Localization of hypo- (left) and hyper- (right) methylated DMRs relative to the transcription start site (TSS) in kb. (E) Genomic location of the hypo- (top) and hyper- (bottom) methylated DMRs. TTS = transcription termination site. (F) Overlap analysis of DMRs with known regulatory DNA elements of the lung. wLung = whole lung tissue, EPU = enhancer promoter units, HS = hypersensitivity. (G) Top: Genome browser view of the Smad6 gene locus. Green bars represent the DMRs showing significant loss of methylation during the acquisition of vascular quiescence. Arrowhead represents the transcription start site. Grey bars represent putative enhancer regions previously defined. Bottom: Detailed view of one representative DMR (transparent red) showing the raw (dots) and the smoothed (lines) methylation data of EC from three infant (green) and three young adult (red) mice. CpGs are represented by vertical lines. The following figure supplements are available for Figure 3. Methylome analysis identified strong DNA demethylation of putative intronic enhancer regions suggesting that DMRs may have regulatory potential on gene expression. As enhancer regions could influence the expression of distant genes, up to three nearby genes were assigned to the quiescence-dependent DMRs by applying the GREAT tool to identify genes likely affected by differential methylation (McLean et al., 2010). The same tool was also used to identify significantly enriched biological functions among the genes next to quiescence-dependent regulated DMRs. The functional annotation of genes next to hypomethylated DMRs revealed signaling pathways controlling vascular patterning (semaphorin interactions) and development/homeostasis (TGFβ family signaling) (Figure 4A). Notably, 94% of the hypomethylated DMRs affecting genes of these pathways were located in intragenic regions with eight DMRs per gene on average (Figure 4—figure supplement 1A , left) resulting in DMR clustering (more than five DMRs per gene locus) in more than 36% of the affected genes (Figure 4B). Contrary, 56% of the hypermethylated DMRs were located in intragenic regions with on average two DMRs per gene (only 5.3% of genes harbored five or more hypermethylated DMRs). Furthermore, genes in the vicinity of gain of methylation DMRs were annotated as endothelial fate control genes (NOTCH signaling) (Figure 4A and B, Figure 4—figure supplement 1A right). In summary, in line with transcriptome analysis, genes of TGFß family and semaphorin signaling were similarly affected by differential DNA methylation. Apart from the functional annotation of genes located in the vicinity of DMRs, these analyses revealed an overrepresentation of DMRs within certain gene loci. Notably, this clustering of DMRs was mostly restricted to loss of methylation DMRs. Correspondingly, DMR clustering was most obvious in induced angiogenic molecules (Figure 4C). The ranking of all genes according to the number of intragenic DMRs further demonstrated that (i) 10% (446) of the affected genes contained more than five intragenic DMRs corresponding to 44% (5,180) of all intragenic DMRs and (ii) 68% of the clustered DMRs showed loss of methylation (Figure 4D, bottom). This analysis highlighted the existence of large intragenic DMR clusters that undergo concerted differential DNA methylation in about 450 genes during transition to endothelial cell quiescence. Furthermore, enrichment analysis among this ranked list of genes confirmed that DMR clusters were overrepresented in genes of TGFβ and semaphorin signaling, particularly in Smad6, Smad7 and Sema6a with up to 61 DMRs in one gene (Figures 3G 4D, top, and 4E). Clustering of loss of methylation DMRs in genes of TGFβ and semaphorin signaling. (A) Functional annotation of genes next to loss of methylation DMRs by the GREAT tool. Listed are the top Reactome gene sets according to the FDR value (sorted in ascending order). (B) Distribution of DMR number/gene (with percentage of genes containing DMR clusters). (C) Characteristics of differentially expressed angiogenic molecules during vascular quiescence that were also differentially methylated (see Figure 2A). (D) Ranking of genes according to the number of intragenic DMRs. The subset of genes containing >5 DMRs (=DMR cluster) is highlighted in grey. Top: Enrichment analysis of the ranked list of genes demonstrated an overrepresentation of semaphorin and TGFβ signaling genes among the genes containing DMR cluster. Red genes: expression significantly induced >1.75 fold, p<0.05. ES = enrichment score. Bottom: Methylation direction and DMR distribution among genes with >5 or≤5 DMRs/gene, respectively. (E) Genome browser views of gene loci with large DMR clusters (Smad7, Sema6a). Putative enhancer regions are shown as grey bars (EPU = enhancer promoter units; wLung = whole lung tissue). (F) Direct correlation of significantly differentially expressed (red and blue circles) and methylated (green and orange circles) genes applying different thresholds to the number of DMRs per gene: no limitations, only genes with intragenic DMRs and only genes with DMR cluster. Numbers in circles represent the overlap without thresholding the number of DMRs. Percentages refer to the fraction of differentially methylated genes that overlap with differentially expressed genes. The following figure supplements are available for Figure 4. The correlation of quiescence-related expression and methylation profiles by gene set enrichment analysis (GSEA) revealed an enrichment of genes with hypomethylated DMRs (young adult vs. infant EC) among the genes induced in adult EC independent of the genomic loci of one or several DMRs. Conversely, genes with hypermethylated DMRs were overrepresented among the genes upregulated in infant EC (Figure 4—figure supplement 1C). In line with this, there was an unexpected high overlap of differentially expressed genes and genes affected by DNA methylation changes. Notably, we identified an increasing overlap of transcriptome and epigenome, when scoring genes on the basis of intragenic DMRs and even more so when scoring based on clustered DMRs (Figure 4F). This correlation implies that genes with intragenic clusters of loss of methylation DMRs are more likely to be induced during acquisition of vascular quiescence than repressed, while those genes with clustered gain of methylation DMRs are more likely to be repressed. Together, these data suggest that vascular quiescence is accompanied by a prominent loss of methylation in intragenic DMR clusters preferentially affecting and regulating the expression of genes involved in the regulation of TGFβ family, semaphorin and NOTCH signaling in this process. Both, the transcriptome and the methylome analysis had highlighted TGFβ family members as relevant molecules during vascular quiescence. Among these, Smad6 and Smad7 contained the largest intragenic cluster of hypomethylated DMRs and showed significant induction during transition to quiescence in lung EC (Figure 2B, Figure 2—figure supplement 1A and Figure 4B). We therefore focused further functional experiments prototypically on these molecules. SMAD6 and SMAD7 inhibit TGFβ family signaling by different mechanisms (ten Dijke and Arthur, 2007). Corresponding to the observed lung endothelial upregulation of Smad6 and Smad7 during acquisition of quiescence, we detected a strong decrease in R-SMAD (receptor-regulated SMADs, SMAD2/3 and SMAD1/5/8) phosphorylation in adult lung tissue confirming an inhibition of TGFβ family signaling in adult mice (Figure 5A). 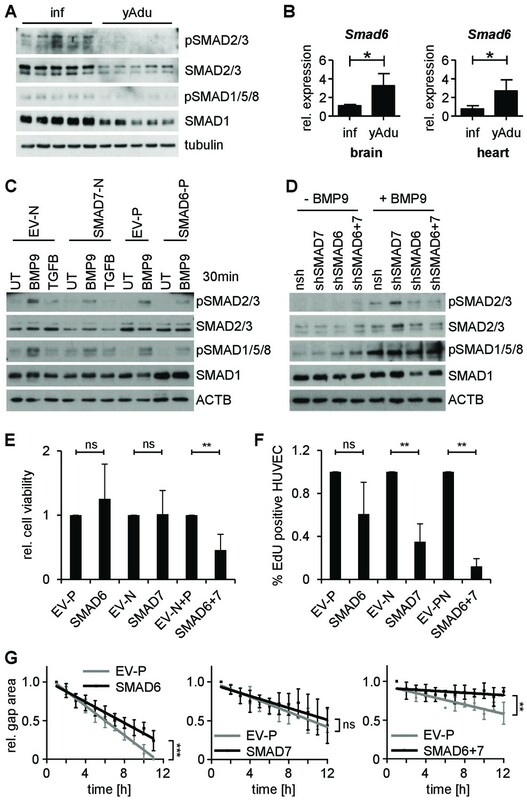 The upregulation of Smad6 and Smad7 during acquisition of vascular quiescence was not restricted to the lung, but also detected in EC isolated from adult mouse brain and heart (Figure 5B and Figure 5—figure supplement 1A). Correspondingly, R-SMAD phosphorylation was decreased in these organs suggesting that TGFβ signaling may vessel bed independently act as global regulator of vascular quiescence (Figure 5—figure supplement 1B and C). As reduced signaling could also be mediated by decreased ligand levels, BMPs and TGFB1 were determined in different organs (Figure 5—figure supplement 1D). TGFβ family ligands were consistently higher in adult organs indicating that regulation of vascular quiescence is achieved through cell intrinsic blocking of the downstream signaling machinery, that is by downregulation of receptors and upregulation of inhibitory SMADs. SMAD6 and SMAD7 control endothelial quiescence. (A) Immunoblot showing the analysis of TGFβ family signaling in whole lung lysates of infant (n = 5) and young adult (n = 5) mice. (B) Validation of Smad6 induction during maturation in the brain and the heart by qPCR. n = 4; mean ±SD; *p<0.05; Mann-Whitney Test. (C,D) Immunoblots showing the analysis of TGFβ family signaling in HUVEC stably expressing (C) or with silenced (D) SMAD6 or SMAD7. UT = untreated, nsh = non silencing shRNA. (E) Analysis of cell viability by MTT assay. ns = non significant; **p<0.01; unpaired t-test. (F) Analysis of HUVEC proliferation by EdU incorporation assay (4 hr) followed by FACS analysis. n ≥ 3; ns = non significant; **p<0.01; unpaired t-test. (G) Analysis of HUVEC migration by lateral scratch wound assay. The gap was measured every hour. EV = empty vector, N/p=neomycin/puromycin resistance. ns = non significant; **p<0.01; ***p<0.001; Linear Regression Analysis. The following figure supplements are available for Figure 5. To further examine if the expression of SMAD6 and/or SMAD7 meditates resistance of EC towards ligand-dependent receptor activation, HUVEC were lentivirally transduced and analyzed in vitro. Forced expression of SMAD6 or SMAD7 in cultured EC, but not gene silencing, led to the reduction of SMAD2/3 and SMAD1/5/8 phosphorylation upon ligand stimulation (Figure 5C and D and Figure 5—figure supplement 2A). Cells overexpressing both, SMAD6 and SMAD7 showed reduced viability upon prolonged cell culture, which was confirmed by MTT assay (Figure 5E and Figure 5—figure supplement 2B). 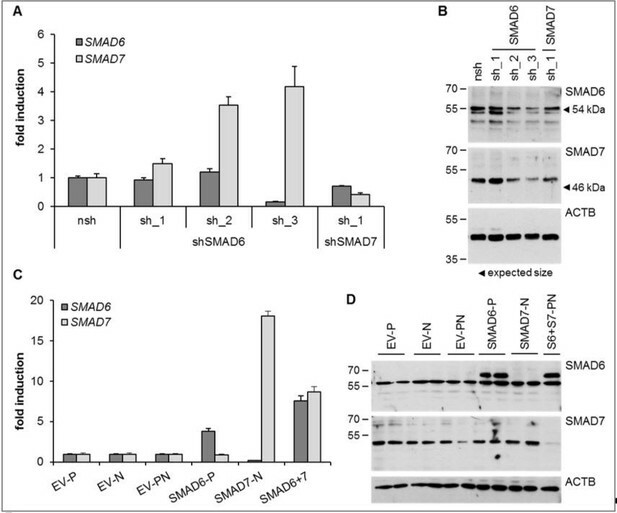 Proliferation and migration of EC overexpressing SMAD6 and SMAD7 was reduced confirming the limited angiogenic potential of SMAD6 and SMAD7 expressing cells (Figure 5F and G and Figure 5—figure supplement 2C and D). Together, these data validate based on expression in vivo and functional experiments in vitro the negative regulation of the TGFβ family signaling as critical for the acquisition of endothelial quiescence during development. Loss of the quiescent EC phenotype is at the heart of vascular dysfunction that is associated with some of the most common and most devastating diseases in humans. Vascular quiescence and the switch from quiescent to activated EC therefore need to be tightly regulated. How the resting phenotype is achieved on the genome-wide epigenetic and transcriptomic level has not been studied so far. This study presents the first unbiased systems biology based profiling of primary EC isolated from infant and adult mice, revealing surprising transcriptomic and epigenetic signatures. It thereby establishes a roadmap for further molecular dissection of mechanisms of vascular quiescence. 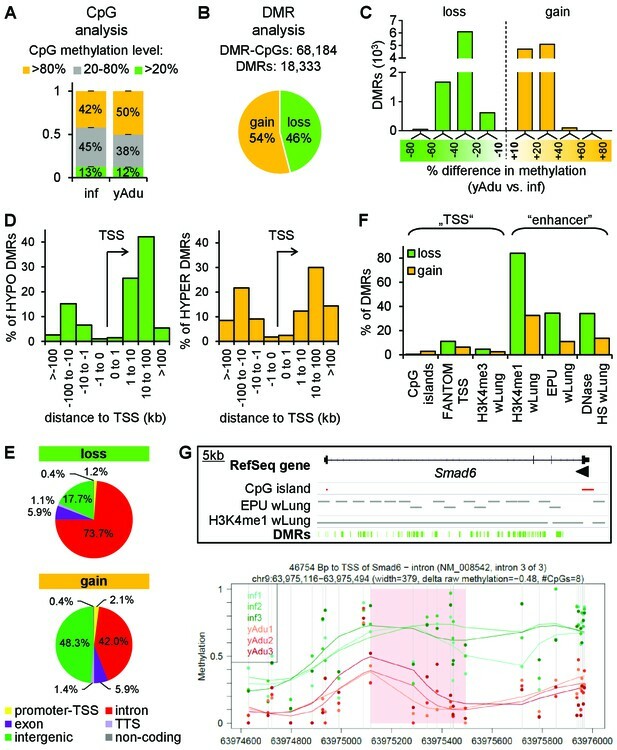 Specifically, extensive bioinformatic data analysis and functional validation demonstrated that the acquisition of EC quiescence (i) is associated with distinct transcriptomic changes affecting pro- and anti-angiogenic molecules with prominent down-regulation of TGFß family signaling molecules and (ii) is accompanied by gain of DNA methylation and more prominent loss of DNA methylation at intragenic enhancer regions preferentially affecting genes of TGFß family and semaphorin signaling. In general, the identified gene expression changes (iii) correlate with changes in DNA methylation in corresponding loci. Notably, (iv) most hypomethylated DMRs were concentrated in large intragenic clusters, with the gene loci of the inhibitory SMADs (Smad6 and Smad7) among the genes containing the largest clusters. Cellular experiments (v) confirmed SMAD6 and SMAD7 as regulators of endothelial quiescence. Together, this study highlights the central role of suppression of TGFβ family signaling during acquisition of vascular quiescence and establishes a database enabling the datamining of transcriptomic and epigenetic changes associated with the acquisition of the quiescent EC phenotype. Although the importance of epigenetic mechanisms regulating vascular function has long been recognized (Dunn et al., 2015; Matouk and Marsden, 2008; Yan and Marsden, 2015), studies of DNA methylation in EC are still in their infancy. Only few genome wide systems biology studies have been performed to dissect epigenetic changes in the vasculature and even less studies have systematically correlated epigenetic changes to transcriptomic signatures. It has been described that proximal promoter DNA methylation regulates EC gene expression and thereby controls EC fate (Shirodkar et al., 2013). Similarly, flow-dependent DNA methylation changes in vessel wall cells have been shown to be enriched in GC-rich, 5’ untranslated, and exonic regions (Davies et al., 2014; Jiang et al., 2015a; Jiang et al., 2015b). These previous studies in EC have determined an enrichment of promoter-associated changes in DNA methylation that coincide with gene regulation. Here, we generated genome-wide high resolution DNA methylation data of primary infant and young adult EC which enabled the identification of an unusual abundance of intragenic (mainly intronic) demethylation events with numerous genes harboring large intronic DMR clusters. Although little is known about the impact of intragenic DNA methylation changes on gene expression, some studies suggest a role in alternative promoter usage or splicing (Kulis et al., 2013; Maunakea et al., 2013; Maunakea et al., 2010; Shukla et al., 2011). Conversely, the quiescent-dependent DMRs identified in the present study overlapped with putative intragenic enhancer features. Moreover, the genome-wide association with gene expression data revealed a good correlation of intragenic hypomethylation and gene induction or hypermethylation and gene repression, respectively. The presence of clustered DMRs was even more likely associated with differential expression changes of the affected gene, suggesting that we have identified intronic regions with high regulatory potential during the acquisition of vascular quiescence. Notably, while we identified a more prominent loss than gain of methylation during acquisition of quiescence, atherosclerosis progression in human appears to be associated with a distinct gain of methylation signature (Zaina et al., 2014). Altogether, these data highlight the important role of epigenetic modifications in the regulation of EC functions and have led to the identification of distinct genomic regions with crucial regulatory potential that will serve as a foundation for further functional studies. Among the transcriptomically and epigenetically regulated genes were molecules of pathways with well-established EC-regulatory function including NOTCH, semaphorin, FGF, WNT and TIE signaling (Marcelo et al., 2013; Patel-Hett and DAmoreD'Amore, 2011). Yet, both unbiased genome-wide approaches of this study, RNA-seq and T-WGBS, converged on a crucial role of TGFß family signaling in the regulation of vascular quiescence. This finding is not novel per se, but TGFß family signaling has been described to result in both, pro- and anti-angiogenic functions in a very context dependent manner (Cai et al., 2012; Dyer et al., 2014; Goumans et al., 2003; Goumans et al., 2002; Larrivée et al., 2012; Mallet et al., 2006; Suzuki et al., 2008). Here, we show in the physiologically most relevant vascular quiescence process (i.e. the comparison of infant and young adult EC) that many important signaling molecules of the TGFß family pathway are differentially regulated leading to reduced signal transduction via R-SMAD phosphorylation in adult tissue despite high ligand levels. As a decisive point, the inhibitory SMADs, Smad6 and Smad7, were epigenetically inhibited by large intronic clusters of methylated DNA during early development and induced in adult EC. Cell culture based analysis confirmed that the expression of SMAD6 and/or SMAD7 in EC mediates resistance to ligand treatment thereby blocking TGFß family signaling. Interestingly, SMAD6 and SMAD7 have originally been identified as vascular SMADs (Topper et al., 1997). Their induction upon laminar shear stress highlights the importance of blood flow in maintaining the quiescent vascular phenotype. Although ubiquitously expressed, they exert particularly prominent vascular function. Smad6 has recently been described to act anti-angiogenic in sprouting assays (Mouillesseaux et al., 2016) and Smad7 has been shown to inhibit peritoneal angiogenesis (Peng et al., 2013). Correspondingly, genetic deletion of Smad6 or Smad7 leads to major cardiovascular defects with partial prenatal mortality (Smad6) (Galvin et al., 2000) or to massive growth retardation with reduced viability (Smad7) (Tojo et al., 2012). In conclusion, the present study underlines the central role of TGFß family pathways during acquisition of the resting EC phenotype including prominent regulation of inhibitory SMADs on the epigenetic level. Remarkably, molecules of the VEGF pathway, the master regulator of angiogenesis induction, were both, transcriptionally and epigenetically not identified as being significantly differentially regulated during the transition to EC quiescence. Surprisingly, the ligand Vegfa was significantly higher expressed in adult EC compared to infant EC. High expression of VEGFA has also been described in the adult brain (Licht and Keshet, 2013). Autocrine VEGF has been proposed to be essential for EC survival thereby fulfilling homeostatic functions. It appears to serve as a rheostat of paracrine acting VEGF to possible even exert negative regulatory functions. In fact, analyses of genetically engineered mice specifically lacking EC-produced VEGF indicate that paracrine VEGF does not compensate for autocrine VEGF (Lee et al., 2007). Conversely, expression of the VEGF decoy receptor Flt1/Vegfr1 (Boucher et al., 2017; Fong et al., 1995; Kappas et al., 2008; Kearney et al., 2002) was in the present study significantly increased (but below threshold of 1.75x) during acquisition of quiescence. Since the expression of the primary VEGF signal transducing receptor Kdr/Vegfr2 was neither in RNA-seq nor in qPCR validation data significantly changed, this results in an increased VEGFR1/VEGFR2 ratio in adults. Altogether, these data imply that VEGF signaling is not dominantly regulated during the transition to vascular quiescence but instead undergoes specific and situation-specific dynamic regulation. In conclusion, the present study has for the first time established the transcriptomic and epigenetic landscape of vascular quiescence in primary lung EC that might also apply to EC of other tissues. These findings reveal that vascular quiescence is comprehensively regulated on both transcriptional and DNA methylation level converging on the prominent inhibition of TGFß family signaling in adult EC. Moreover, the acquisition of the resting EC phenotype is accompanied by a dynamic balance of activating and inhibiting pathways. These findings might in the future potentially pave the ways towards fundamentally novel strategies to therapeutically interfere with unwanted EC activation during disease. The study thereby lays a foundation for mechanistic and functional studies of individual genes and complex gene signatures involved in the transition from the activated to the quiescent phenotype and vice versa. C57BL/6N female mice were obtained from Taconic (Taconic Biosciences, Europe). After arrival, mice were kept in ‘Individually Ventilated Cages’ (IVC) to maintain the health status as declared by Taconic as ‘Murine Pathogen Free'. Lungs were processed for EC isolation 1–3 days after arrival. Animals had free access to food and water and were kept in a 12 hr light-dark cycle. All mice were handled according to the guidance of the Institute and as approved by the German Cancer research center (No. DKFZ305). No statistical methods were used to predetermine sample size. The experiments were not randomized and the investigators were not blinded to allocation during experiments and outcome assessment. The following primary antibodies were used: rat anti-CD31 (551262, BD Biosciences, diluted 1:100), rat anti-CD34 (48–0341, eBioscience, diluted 1:50), rat anti-LY76 (561032, BD Biosciences, diluted 1:200), rat anti-LYVE1 (53–0443, eBioscience, diluted 1:250), hamster anti-PDPN (53–5381, eBioscience, 1:100), rat anti-PTPRC (553080, BD Biosciences, 1:400). Mice were injected s.c. with EdU (50 μg/g mouse) 17 hr prior to sacrificing the animals. Lungs were removed and cells were isolated and surface-stained as described in the corresponding section. For additional EdU-labeling cells were fixed, permeabilized and stained using the Click-iT Plus Alexa Fluor 555 Picolyl Azide Toolkit (ThermoFisher Scientific, Germany) according to the manufacturer’s instructions. Organ cryosections were fixed in ice-cold methanol for 10 min at −20°C. Blocking was performed with 10% goat serum (ThermoFisher Scientific, Germany) for 1 hr at RT. The vasculature was stained for CD31 and proliferating cells for KI67 overnight at 4°C. The sections were subsequently incubated with the appropriate secondary antibody for 1 hr at RT. Pictures were taken using the Zeiss Cell Observer and image analysis was accomplished with Fiji. The following primary antibodies were used: rat anti-CD31 (553370, BD Biosciences, 1:50), rabbit anti-KI67 (GTX 16667, Gene Tex, 1:100), goat IgG (A11006, ThermoFisher Scientific, 1:500), goat IgG (A11071, ThermoFisher Scientific, 1:500). HUVECs were purchased from PromoCell (Heidelberg, Germany) and cultured in Endopan 3 with 3% FCS and supplements (PAN Biotech, Aidenbach, Germany) at 37°C, 5% CO2 and high humidity. Passages < P6 were used for all experiments and cells were tested negative for mycoplasma contamination. For Lentiviral transduction (pLenti-based overexpression or pGIPZ-based silencing of certain molecules), 1 × 105 cells were seeded and 24 hr later lentivirus was added for 16 hr. Media was changed to Endopan with supplements for 24 hr before starting the selection with puromycin (P; 0.4 µg/ml) or neomycin (N; 200 µg/ml) or both (P 0.3 µg/ml and N 150 µg/ml) for 3–4 days. The following lentiviral vectors were used: pLenti-CMV-EV-puromycinRes (control), pLenti-CMV-EV-neomycinRes (control), pLenti-CMV-SMAD6-puromycinRes (overexpression), pLenti-CMV-SMAD7-neomycinRes (overexpression), pGIPZ-ns-shRNA (control), pGIPZ-shSMAD6-118 (depletion), pGIPZ-shSMAD7-115 (depletion). Cells were starved in Endopan without supplements for 2–4 hr before treating with 5 ng/ml BMP9 (R and D Systems, Minneapolis, Minnesota, US) or 10 ng/ml TGFB (R and D Systems, Minneapolis, Minnesota, US) for 30 min. For EdU incorporation analysis EdU was directly added to the subconfluent cells at a final concentration of 10 µM for 4 hr. Harvesting, fixation, permeabilization and staining were performed using the Click-iT EdU Flow Cytometry Assay Kit Alexa Fluor 647 (ThermoFisher Scientific, Germany) according to the manufacturer’s protocol. Cells were analyzed on a BD FACSCanto II (BD Bioscience, Heidelberg, Germany). MTT assay was performed in 96well plates according to manufacturer’s instructions (Roche, Germany). Migration analysis was performed by scratch assay in 24well plates. To prevent cell proliferation during migration analysis cells were treated with 10 µg/ml mitomycin C (Sigma, Munich, Germany) for 1.5 hr prior to scratching the monolayer. Pictures were taken either manually at certain time points (as indicated in the figures) at an Olympus IX71 Microscope (10x) or automatically every hour at an Olympus Cell^R Microscope with cell incubation chamber (10x). Image analysis was accomplished with Fiji. Ligand level in tissue lysates were determined by ELISA according to the manufacture’s protocols. BMP6 was measured by the ELISA Kit for Bone Morphogenetic Protein 6 (BMP6) (SEA646Mu, Cloud Clone, Katy, Texas, US), BMP9 was measured by the Mouse BMP9 ELISA Kit (ELM-BMP9, RayBiotech Norcross, Georgia, US) and TGFB1 was measured by the TGF-β1 Quantikine ELISA Kit (MB100B, R and D systems, Minneapolis, Minnesota, US). For BMP6 and BMP9 determination in lung and brain 100 ng/µl total protein concentration, for BMP6 and BMP9 measurement in heart 10 ng/µl total protein concentration and for TGFB1 detection in lung and heart 500 ng/µl total protein concentration was utilized. Cells (whole tissue fragments or HUVEC) were lysed in RIPA buffer (1% NP-40, 0.1% Sodium dodecyl sulphate, 0.5% Sodium deoxycholate, 10% glycerol, 5 mM EDTA) supplemented with proteinase inhibitor mix (Serva Electrophoresis, Heidelberg, Germany) and sodium orthovanadate (Sigma, Munich, Germany). Protein lysates were separated on 10% polyacrylamide-SDS gels and blotted on nitrocellulose membranes. Membranes were blocked with 3% BSA and incubated with the indicated primary antibodies at 4°C over night. Horseradish peroxidase-conjugated secondary antibodies were used for chemiluminescence detection. For detection, either an AGFA classic EOS developer (AGFA, Mortsel, Belgium) or an Amersham Imager 600 (GE healthcare, Little Chalfont, UK) was used. The following primary antibodies were used: rabbit anti-pSMAD1/5/8 (D6656/Vli31, Maine Medical Center, 1:2000), rabbit anti-SMAD1 (9743S, Cell Signaling, 1:1000), rabbit anti-pSMAD2/3 (D6658, Maine Medical Center, 1:2000), rabbit anti-SMAD2/3 (5678, Cell Signaling, 1:1000), rabbit anti-ACTB (sc-1616, Santa Cruz Biotechnology, 1:5000), goat IgG (P0448, Dako, 1:5000). Total RNA of FACS-sorted mouse ECs was isolated with Arcturus PicoPure RNA Isolation Kit (ThermoFisher Scientific, Germany) and RNA of HUVECs was isolated with RNeasy Mini Kit (Qiagen, Hilden, Germany) according to the manufacturer’s protocols. cDNA was synthesized with QuantiTect Reverse Transcription Kit (Qiagen, Hilden, Germany) according to the manufacturer’s instructions. Subsequent qPCR was performed with TaqMan gene expression assay (ThermoFisher Scientific, Germany), TaqMan Fast Advanced Mastermix (ThermoFisher Scientific, Germany) and the StepOnePlus Real-Time PCR System (ThermoFisher Scientific, Germany). Actb (mouse EC) or HPRT (HUVEC) was used for data normalization. The following TaqMan gene expression assays (ThermoFisher Scientific, Germany) were used: Acta2 (Mm00725412_s1), Actb (Mm00607939_s1), Bmpr2 (Mm00432134_m1), Ccnb1 (Mm03053893_gH), Ccnb2 (Mm01171453_m1), Cdk1 (Mm00772472_m1), Cyr61 (Mm00487501_g1), Fgfr1 (Mm00438930_m1), HPRT (Hs02800695_m1), Icam1 (Mm00516023_m1), Kdr (Mm01222421_m1), Notch3 (Mm01345646_m1), Nr2f2 (Mm00772789_m1), Ptprc (Mm01293577_m1), Sema3c (Mm00443121_m1), Smad6 (Mm01171378_m1), SMAD6 (Hs00178579_m1), Smad7 (Mm00484742_m1), SMAD7 (Hs00998193_m1), Stat1 (Mm00439531_m1), Tgfbr2 (Mm00436977_m1). Total RNA from mouse lung EC was isolated using Arcturus PicoPure RNA Isolation Kit (ThermoFisher Scientific, Germany) according to the manufacturer’s instructions. DNA was removed by treating with RNase-free DNase Set (Qiagen, Hilden, Germany). Quality control was performed by Qubit (ThermoFisher Scientific, Germany) and Bioanalyzer (Agilent, Waldbronn, Germany) measurements. Sequencing library was generated with 10 ng of total RNA using the SMARTer Ultra Low RNA Kit for Illumina Sequencing (Clontech, Mountain View, California, US) according to manufacturer’s protocol. Sequencing reads (100 bp Paired-End) were generated on the HiSeq2000 platform (Illumina, San Diego, California, US) with four samples per lane. The sequenced reads were aligned to the mouse reference genome mm10 using STAR (Dobin et al., 2013) allowing up to 10 mismatches. The average transcriptome coverage was 37.8 ± 4. DEseq2 was used to test for differential gene expression (mm10, RefSeq gene annotation) (Love et al., 2014). RNA-seq data are available at the NCBI Gene Expression Omnibus (GEO) under accession number GSE86600. Only transcripts with an RPKM ≥1 in at least one sample were considered for further analysis. Significantly differentially expressed genes were defined as more than 1.75-fold regulated (p<0.05). Hierarchical clustering was performed using GenePattern Software (Reich et al., 2006). For functional annotation with Reactome gene sets, the Molecular Signature Database (MSigDB) (Subramanian et al., 2005) was used. Upstream analysis with activation state prediction was generated by using QIAGEN’s Ingenuity Pathway Analysis (IPA, QIAGEN Redwood City). According to the manual, “the upstream regulator analysis is based on prior knowledge of expected effects between transcriptional regulators and their target genes stored in the Ingenuity Knowledge Base. The analysis examines how many known targets of each transcription regulator are present in the user’s dataset, and also compares their direction of change (i.e. expression in the experimental sample(s) relative to control) to what is expected from the literature in order to predict likely relevant transcriptional regulators. If the observed direction of change is mostly consistent with a particular activation state of the transcriptional regulator (‘activated’ or ‘inhibited’), then a prediction is made about that activation state.’ The list of chromatin modifying enzymes has been described previously (Plass et al., 2013). Genomic DNA from sorted EC was isolated using the QIAamp DNA Micro Kit (Qiagen, Hilden, Germany) according to the manufacturer’s instructions. T-WGBS was essentially performed as described previously (Wang et al., 2013) using 30 ng genomic mouse DNA as input. Three sequencing libraries were generated per sample and each was sequenced 100 bp, paired-end on one lane of a HiSeq2000 (Illumina, San Diego, California, US) machine. Validation of selected T-WGBS data was performed by MassARRAY (Agena Bioscience, Hamburg, Germany) as described previously (Sonnet et al., 2014) using primers listed in the Supplementary file 1. Forward primers for MassARRAY were 5' tagged with AGGAAGAGAG, reverse primers with CAGTAATACGACTCACTATAGGGAGAAGGCT. We used a mapping method as described earlier (Johnson et al., 2012) modified for reads from tagmentation-based whole-genome bisulfite sequencing. Briefly, the mm10 reference genome was transformed in silico for both the top strand (C to T) and bottom strand (G to A). Before alignment, adaptor sequences were trimmed using SeqPrep (St John, 2016; https://github.com/jstjohn/SeqPrep). Then the first read in each read pair was C-to-T converted and the 2nd read in the pair was G-to-A converted. The converted reads were aligned to a combined reference of the transformed top (C to T) and bottom (G to A) strands using BWA (bwa-0.6.1-tpx) (Li and Durbin, 2009) with default parameters except the quality threshold for read trimming (-q) of 20 and the Smith-Waterman for the unmapped mate disabled (-s). After alignment, reads were converted back to the original states and reads mapped to the antisense strand of the respective reference were removed. Duplicate reads were removed using Picard MarkDuplicates (http://picard.sourceforge.net/). Reads with alignment scores less than one were filtered before subsequent analysis. Total genome coverage was calculated using the total number of bases aligned from uniquely mapped reads over the total number of mappable bases in the genome. At each cytosine position, reads that maintain the cytosine status were considered methylated, and the reads that have cytosine converted to thymine were considered unmethylated. Only bases with Phred-scaled quality score of ≥20 were considered. For libraries prepared with the tagmentation protocol, first 9 bp of the second read and last 9 bp before the adapter in the first read were excluded from methylation calling. Bisulfite conversion rates were estimated using the methylation level at CH sites. DMR calling was performed as described previously (Bauer et al., 2016) with minor modifications. In brief, DMR calling was conducted on methylation data without smoothing (due to sufficiently high coverage) with the bsseq v1.60 package (Hansen et al., 2012) for R statistical software v3.2.2. We applied a coverage filter that required a minimum coverage of 8x per CpG in at least two of the three samples per group. The DMR model comprised at least three consecutive significant CpGs (each p<0.05, t-test) and a minimum difference of 10% in mean methylation between groups. Intersection with known regulatory genomic features was performed with Galaxy (Afgan et al., 2016) using published datasets (H3K4me3 ChIPseq: ENCSR000CAR; H3K4me1 ChIPseq: ENCSR000CAQ; DNase Hypersensitivity: ENCSR000CNM) and enhancer-promoter units (EPU) defined in mouse lung tissue (Shen et al., 2012; Yue et al., 2014). For data visualization tracks were loaded into the IGV browser (Robinson et al., 2011). Motif searches for known transcription factor binding sites (TFBS) in DMRs and TFBS enrichment over background were analyzed with the ‘findMotifsGenome.pl’ script of the HOMER tools software package (Heinz et al., 2010). Genomic annotation of DMRs to the nearest TSS was obtained with the ‘annotatePeaks.pl’-script of the HOMER tools software package (Heinz et al., 2010) to genome version mm10. Functional annotation of up to three nearby genes of DMRs was accomplished using the GREAT tool (McLean et al., 2010). For enrichment analysis among a ranked list of genes (sorted according to the number of DMRs or rel. gene regulation) the Gene Set Enrichment Analysis (GSEA) Software was applied (Subramanian et al., 2005). Tagmentation-based WGBS data are available at the NCBI Gene Expression Omnibus (GEO) under accession number GSE87374. To gain further functional insights into the mechanisms of EC quiescence, we generated a network from genes that were significantly differentially regulated (p<0.05). For generating such a network, we used the DIAMOnD algorithm (Ghiassian et al., 2015), which creates a network starting from a set of proteins (so-called seed set) by integrating related proteins into the network based on their topological relevance to the initial seed set. DIAMOnD first ranks all proteins in the interactome according their connectivity significance with respect to the seed set. Next, the protein with the highest rank, that is, lowest p-value, is added to the initial network. The procedure is repeated with the extended seed set, until the incorporation of seed proteins saturates. Genes with a FC above 1.75 or below −1.75, were mapped to their corresponding gene products and selected as seeds for generating the network, with a total of 972 genes being up and 2,251 genes being down regulated (a total of 3,223 regulated genes). The mouse interactome comprised 7,267 proteins and 18,382 protein interactions, obtained by merging publicly available data from the major public protein-interaction databases. In the end, 227 (23.4%) upregulated and 618 (27.5%) downregulated proteins were covered in the assembled mouse interactome and used as seed proteins to generate the EC specific interaction network. Given the incompleteness of the mouse interactome, a large number of DIAMOnD iterations were necessary to connect all seed proteins through interactions, that is, 5,943 iterations were needed to link 99.3% of the proteins. In consequence, the resulting network was very large, covering about 93% of the mouse interactome. Since we were primarily interested in proteins functionally related to EC quiescence, we applied a strict threshold, terminating the network generation after the first steep increase in the proportion of incorporated seeds started to flatten (iteration: 265). The EC quiescence specific network with 745 proteins and 1,661 interactions is shown in the Figure 1—figure supplement 2. A total of 484 seed proteins (57.3%) were connected in the network through 261 linker proteins, which were of high functional interest with respect to EC quiescence. Next, we assessed whether proteins forming the EC quiescence network were functionally coherent with respect to the initial seed set. To this end, we performed a functional enrichment with g:Profiler (Reimand et al., 2016) of two protein sets, namely (i) proteins of the seed set covered by the interactome, and (ii) proteins of the network, and compared the respective outcomes focusing on KEGG pathways. As background set, we used the 7,267 proteins comprising the mouse interactome. As the reduced seed set might yield a distinct enrichment, we performed in addition a functional enrichment for proteins of the complete initial seed set. The complete list of enriched pathways for each protein is shown in Figure 1—source data 1. In general, we observed a large overlap of enriched pathways between the seeds and the EC quiescence network. These findings emphasized that proteins captured in the network were of functional relevance with respect to proteins regulated in EC quiescence. To obtain more insights from the generated network, we performed network clustering identifying densely connected subgraphes, so called communities. The 23 detected cluster were ranging in size from two to 165 proteins. For each of the cluster, we performed functional enrichment analysis using g:Profiler (Reimand et al., 2016). Nature Reviews Molecular Cell Biology 8:464–478. Nature Reviews Molecular Cell Biology 10:165–177. The Journal of Cell Biology 214:807–816. Arteriosclerosis, Thrombosis, and Vascular Biology 35:1562–1569. Trends in Endocrinology & Metabolism 25:472–480. Trends in Cardiovascular Medicine 13:301–307. Nature Reviews Molecular Cell Biology 12:551–564. British Journal of Cancer 49:405–413. Arteriosclerosis, Thrombosis, and Vascular Biology 35:1317–1326. Current Protocols in Molecular Biology Chapter 21:Unit21.23. The Journal of Cell Biology 181:847–858. Biochimica Et Biophysica Acta (BBA) - Gene Regulatory Mechanisms 1829:1161–1174. Cellular and Molecular Life Sciences 70:1727–1737. The International Journal of Developmental Biology 55:353–363. Nature Reviews Molecular Cell Biology 8:857–869. Arteriosclerosis, Thrombosis, and Vascular Biology 35:2297–2306. Cell Adhesion & Migration 7:101–110. Thank you for submitting your work entitled "Transcriptional and epigenetic programming during the transition from developmental angiogenesis to vascular quiescence" for consideration by eLife. Your article has been reviewed by three peer reviewers, one of whom is a member of our Board of Reviewing Editors and the evaluation has been overseen by a Senior Editor. The reviewers have opted to remain anonymous. Whilst the reviewers found your work of interest they felt it lacked sufficient experimental validation of several claims. The identification of genetic and epigenetic regulation mechanisms in vessel maturation and quiescence is indeed seen as a timely and important question, and the reviewers see that your data has the potential to become an important catalogue for future studies. However, in the absence of strong validation of function, in particular in vivo and given that it remains very unclear what aspect of the regulation truly relates to quiescence rather than organ specific vessel adaptations, it was felt there will need to be a substantial amount of extra work to clarify the true value of the data. The importance of Tgfb in vessel maturation per se is not deemed novel, and it is felt your work adds little new insight to advance the understanding of how this pathway achieves maturation. The epigenetic regulation, the methylome analysis and the identification of hot spots of DMRs in is seen as a potential strength, but also lacks functional validation. As ELife does not encourage asking for extensive revisions that will likely take a lot of time. we decided it will be most appropriate to return the manuscript to you. If, however you feel you can address the full critique below and can identify a set of key experiments that will validate the claims within a short time, you may of course appeal our decision. The manuscript by Schlereth and colleagues addresses the important question of how endothelial cell maturation and quiescence is regulated through genetic and epigenetic mechanisms. The authors take an unbiased whole genome approach using RNA seq to study gene expression, combined with analysis of gain and loss of methylation to assess epigenetic regulation. The authors use mouse lung as model selecting postnatal day 8 as adolescent stage, and 8-12 weeks as adult stage. FACS sorted cells are processed for analysis. Comprehensive bioinformatic analysis identified regulated gene networks associated with quiescence and qPCR of a few genes confirms the RNA seq data. Probably the most interest new data relate to the identification of prominent differential methylation of intragenic clusters in ECs during methylation, with intronic enhancers prominently featuring as differentially methylated regions. Key regulated pathways include JAK-STAT and TGFb signaling, in the case of the latter, strong upregulation of the inhibitory smads 6 and 7. These are also targets of epigenetic regulation and could be confirmed in isolated cells from brain and heart. Overall, the authors conclude that the identified regulatory mechanisms drive endothelial quiescence and maturation. Whilst the comprehensive approach is interesting and contains valuable information, there are aspects that reduce enthusiasm as the conclusions appear somewhat overstated or unclear. Given that the study is essentially based on sorted cells from one organ, it is unclear whether the gene networks identified truly signify general mechanisms of quiescence or rather relate to maturation of the lung vasculature in particular. For example, it seems possible that the lung vasculature is particular active in immune-related signaling given the strong exposure to pathogens. It is noteworthy that the authors do not state what the pathogen status of the animals is. They were purchase from Taconic, but no other information is provided. The regulation of angiotensin is also interesting as the lung vasculature runs under different pressure regimes compared to the rest of the body. Again, is this lung specific? Some genes that are found would further suggest that not all sequences come from endothelial cells. For example, Notch3 is normally not expressed by EC to my knowledge. The Results sections does not contain information how the authors controlled for purity. The Materials and methods section however show that the isolation is not only done by FACS but preceded by dynabead magnetic sorting. Given that the lung tissue develops substantially between the selected stages, it would be important to understand whether the two stages had similar levels of non-EC contamination. The isolation and digestion procedures are bound to be affected differently. This needs to be explained. 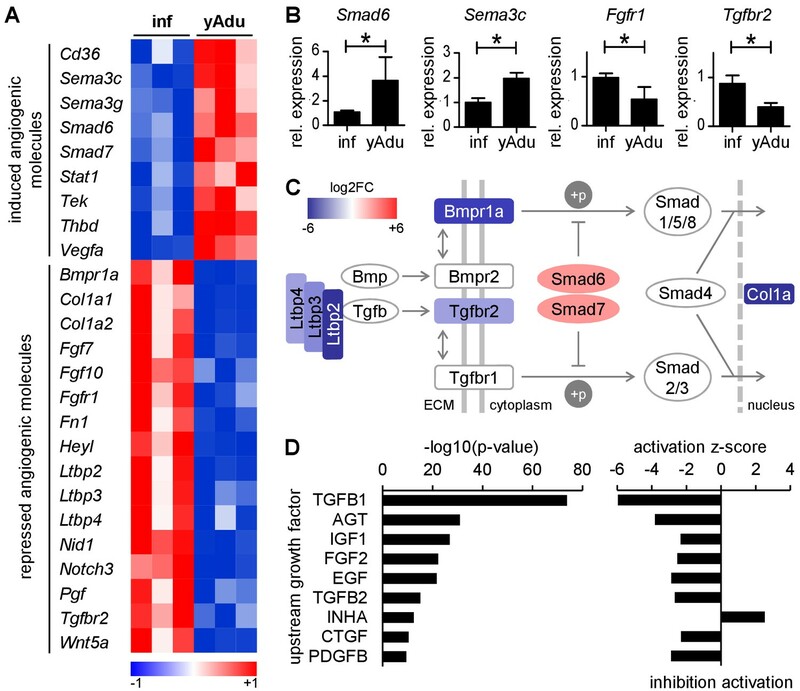 As the most strongly regulated pathway, the authors identify Tgfb, in particular smad6 and smad7. To my understanding, these are activated differentially downstream of BMP and Tgfb signaling. Although they act as repressors, their engagement in a feedback loop would normally imply that Tgfb signaling may be activated in maturation. There is little detailed analysis of this question. A general inhibition of either Tgfb or BMP would be expected to drive endothelial activation, not necessarily quiescence. A detailed analysis of the phosphorylation status of R-smads in vivo would seem important to understand this. Overexpression of just the inhibitory smads may not at all reproduce the situation the authors find in vivo. In conclusion, the present work provides an interesting starting point, with data that may become valuable for the field with time, once further functional validation has been done. It would be unreasonable to ask for full validation of the extensive regulatory networks. But it may be possible for the authors to further validate the role of Tgfb pathway, in particular to dissect whether the assumed quiescence regulation is indeed only achieved through epigenetic regulation of the inhibitory smads, or not (ligand levels etc.). If so, it would be critical to investigate whether such a mechanism provides endothelial cells with a state of resistance to ligand induced activation? Can the authors modify the methylation experimentally? If no further validation/clarification can be provided, the present work will be a catalogue plus some conceptual advance that however remains to be tested. I am unsure whether the authors will be able to provide sufficient confirmation with a limited revision for eLife. This study provides a description of the transcriptomic and epigenetic landscape of endothelial cell maturation by performing analyses on ECs isolated from day 8 and young adult mice (8-10 weeks old). Numerous changes are cataloged. Robust changes are seen in Smad6 and Smad7 and their roles as anti-angiogenic, anti-proliferative signaling molecules is validated by in vitro studies. A detailed analysis of Smad6 and 7 on control of EC responses to BMP and lateral branching was published last year by Bautch's group. It is not cited here. In the Discussion section it is stated that "SMAD6 and SMAD7 have originally been identified as vascular SMADs and are, in fact, expressed almost exclusively in EC (Topper et a., 1997)" citing a 20 year old paper. I doubt that this is true. A PubMed search suggests that they are ubiquitously expressed. The manuscript seeks to investigate the transcriptional and epigenetic mechanisms that control endothelial quiescence. This is still a fairly unexplored area of vascular biology; thus, the study is timely and welcome. To achieve their aim, the Authors use FACS sorted lung EC from newborn mice (P 8) and young adult mice (8-12 weeks) for RNA Seq and methylation analysis. The study takes a novel approach to the question of quiescence. Transcription profiling identifies over 2000 genes differentially expressed in newborn vs young adult; GO analysis identifies genes involved in multiple families including cell cycle, and proliferation analysis of EC from various organs using EdU and Ki567 profiling shows decreased EC proliferation in the adult. Figure Figure 1 shows two of the pathways that may be involved in this phenotypic switch, namely the JAK-STAT pathway and the TGFb pathway. Given that the focus of the study is on quiescence, it would be important to provide the list of genes involved in cell cycle regulation. The network analysis in Figure 1—figure supplement 2 is not very helpful; it could be removed and replaced by small selected networks with each gene labelled. Of the partial list of genes involved in angiogenesis shown in Figure 2, the very noticeable absents are members of the VEGF/VEGFR families. The Authors acknowledge this, but do not discuss the possible reasons. This should be addressed in the Discussion section. Also, this somewhat weakens the argument made throughout the paper that angiogenic pathways are regulated during the progression to adulthood. A key player in this process appears to be TGFb, which becomes the focus of the second half of the manuscript. Therefore, I would recommend altering the sections of the paper where they claim that angiogenic pathways are crucially regulated. The title also should be modified, since it creates an expectation of a major focus on angiogenesis pathways, when in fact most of the validated analysis is on TGFb pathways. Having profiled the transcriptome, the Authors proceed to profile the methylome. This is an interesting and novel experiment, and the result of potential value; other studies on EC methylation have been carried out but not on this model of young vs adult mouse EC. Data description and representation should provide more detail in the text and not only in the figure legends and Materials and methods section. Figure 3A shows a difference on CpG methylation and DMRs between newborn and young adult EC: is the difference statistically significant? Analysis of the location of DMRs identifies regions distal from the TSS as enriched in DMRs; the figure also shows EPU: enhancer promoterUnits, (defined in the figure legend not in the text): how are these identified? Analysis of TF motifs within DMRs identifies FOX and ETS as the most represented and conclude that FOX motifs are demethylated in adult whilst ETS motifs acquire methylation in adult EC, suggesting that ETS pathways, active in newborn mice, are switched off in the adult, and the opposite for FOX. Based on these findings, the Authors conclude that there is a switch between FOX and ETS pathways which controls the progression to adult quiescent EC. This is an interesting hypothesis, but it is not demonstrated and therefore the conclusions are too speculative. Firstly, the ERG (ETS) binding site is significant in both gain and loss regions – this is not mentioned in the text. Also, levels of TF from these families do not support the "switch" model, since they find no difference in the FOX group, an increase in 3/5 IRF TF and a mix of up-regulation, down-regulation or no effect in the 5 ETS factors investigated. Thus, motif analysis is not consistent with TF expression; that may not necessarily be a conflict, since there are more factors in each family, and their expression levels may not be the key determinant of function. However, lack of correlation between TF expression and TF motif methylation somewhat weakens the theory of a "switch" and suggests more of a modulation. There is also an issue with methylation status, which on a gene to gene basis does not consistently predict induction or repression of the gene (Figure 5D and Figure 6D). Also, are any FOXO or ETS target genes differentially regulated between infant and young adult mice (c.f. Figure 2A)? this is not mentioned, and it seems an odd omission to the study. Crucially, validation of the role of this FOX – ETS switch needs to be carried out experimentally, by testing whether the changes in DMRs at these motifs are transcriptionally meaningful and result in differential gene expression of the TF targets, as well as differences in EC proliferation. The study then moves on to the TGFβ pathway and SMADs signalling, with some straightforward in vitro validation of selected targets. Surprisingly, the TF motif analysis there is no sign of SMAD motifs. This is not discussed – it would be interesting to know the Authors view on this. Involvement of TGFb in maturation/differentiation is not a particularly novel finding, but it is still novel in this model and with this approach. There are two separate stories in this paper, which at present do not sit comfortably together: a more preliminary one, to do with the FOX/ETS switch and the other one, more mature, on the TGFb pathway. In summary, this is a very interesting study with novel data of potential interest to the vascular biology community. However, some of the conclusions are not supported by the data and require more validation. Thank you for submitting your article "Genome-wide profiling of endothelial cells identifies TGFß family signaling as key regulator of vascular quiescence" for consideration by eLife. Your article has been reviewed by three peer reviewers, and the evaluation has been overseen by Didier Stainier as the Reviewing and Senior Editor. The following individuals involved in review of your submission have agreed to reveal their identity: Gou Young Koh (Reviewer #1); Rosemary Akhurst (Reviewer #3). The reviewers have discussed the reviews with one another and I have drafted this decision to help you prepare a revised submission. None of the reviewers' queries involve additional experiments, except possibly one concerning Smad6 and 7 (see below). Also, in order for you to see the full extent of the reviews, I have kept them separate. Hopefully, you will find them helpful as you revise the manuscript. The aim of this revised manuscript from Schlereth et al., manuscript is to discover which molecules drive endothelial cell (EC) quiescence. To achieve this, they compare EC gene expression changes that occur as new born mice progress to adulthood and establish and maintain a quiescent adult endothelium. The group undertake an "-omics" comparison of FACS sorted (CD34+CD31+) lung ECs harvested from suckling mice (8-10dpp) versus those harvested from adult mice (6-8 weeks dpp) mice, including transcriptomic profiling and DNA methylomics. One question that came up in the discussion was in regard to the lack of Smad6 and 7 Western blots (or in situ or immunostaining in vivo) to look at the level of expression of these genes/proteins. Was it attempted and not successful? Two reviewers thought that it would be a very nice addition to the paper. The manuscript by Schlereth et al., tackle the important yet unanswered question in the field of vascular biology, the acquisition of quiescence in endothelial cells (ECs). The authors compared freshly isolated ECs from infant and young adult mouse lungs to gain insight about the dominant regulators that generate stable vasculature in healthy, normal mice. By incorporating unbiased whole genome approach with transcriptome and methylome analysis, and also by analyzing ECs from multiple organs, this study provides valuable insights and information which has broad applicability for future studies in the field. The convergence of evidence from transcriptome analysis and methylome analysis all pointing toward TGFβ signaling and in vitro validation of the role played by Smad6 and Smad7 on EC quiescence make a strong case for TGFβ being a key regulator of EC quiescence. Few minor adjustments would help improve this manuscript before publication. 1) Subsection “TGFs family signaling is inhibited in quiescent EC”: "Surprisingly, members of the VEGF/VEGFR pathway were not identified as being transcriptionally regulated." This sentence is rather confusing, given that in Figure 2A, heatmap showed upregulation of Vegfa in EC of young adult, and also in Figure 1—figure supplement 1B, EC of young adult seems to have higher expression of Kdr (Vegfr2) compared to EC of infant. Does it mean that heatmap and RT-PCR results are not statistically significant? Or does it mean that IPA analysis of upstream regulators did not reveal VEGF/VEGFR pathway as one of significantly altered signaling pathways? Also, in the Discussion section, the authors wrote "Since the expression of the primary VEGF signal transducing receptor Kdr/Vegfr2 was not changed,…". Is the expression level of Kdr not changed in RNA-seq or RT-PCR data, or both? More detailed explanation is required to avoid confusion. 2) Subsection “Clustered intragenic loss of methylation regulates TGFβ family and semaphorin signaling in quiescent endothelial cells”: "The correlation of quiescence-related expression and methylation profiles revealed an upregulated expression of genes with hypomethylated DMRs in adult EC independent of the genomic loci of one or several DMRs." This is clearly not the case for Sema6a as shown in Figure 4 and Figure 4—figure supplement 1A. Intragenic regions of Sema6a showed multiple DMRs, but its expression level is downregulated in young adult ECs. Smad7, on the other hand, showed multiple DMRs in intragenic regions and showed significant upregulation in expression level in young adult ECs, agreeing with the authors' claim. This discrepancy clearly suggests that hypomethylation does not guarantee upregulation of expression level of the affected genes. The authors should at least discuss this matter in more detail and avoid writing generalized statements concerning hypomethylation and the direction of gene expression changes, which seem oversimplified in the current version of the manuscript. 3) Does the number of DMRs in a given gene have a direct correlation with the extent of expression change of that gene? In the Discussion section, the authors wrote "The presence of clustered DMRs was even more likely associated with differential expression changes of the affected gene, suggesting that we have identified intronic regions with high regulatory potential during the acquisition of vascular quiescence." However, heatmap in Figure 4—figure supplement 1B showed strong expression changes of Tek, which has only one DMR. Several other genes also showed significant expression changes while having a small number of DMRs (Ltbp3, Nid1, Tgfbr2, etc.). If there is no direct correlation, what is the meaning of Smad6 and Smad7 containing the largest cluster of DMRs? Are those just a lucky coincidence or are there more profound biological meaning to it? More detailed explanation would definitely help readers to understand this manuscript better. The manuscript has significantly improved in terms of focus and clarity. There are a few aspects which in my view could be improved. 1) Several pathways are mentioned, and some are validated in the course of the study. It is not always clear how these were prioritised. Early on, they state that "Functional enrichment analysis of the EC quiescence interactome led to the identification of JAK‐STAT signaling being highly enriched". Figure 1—source data 1 lists several other pathways, as expected. The text (subsection “Endothelial transcriptomic changes during acquisition of vascular quiescence”) should be reworded to make it clearer that several pathways were identified (some of which somewhat surprising to this reviewer), and that the JAK-STAT was the most significant. Strangely, this pathway is not mentioned again and is not validated. Is there a reason for this? 2) Figure 1—figure supplement 2 is not particularly useful, given that no nodes have been assigned labels (given the size of the network, that would be impossible). It is not easy to find a reader-friendly way to present this kind of analysis. It might be more helpful to select a few networks, including the Jak-Stat, Notch and TGF b pathways, and show network analysis related to these in detail, with names and direction of change in infant vs adult EC. 3) The Authors move on to a selection of angiogenic molecules (Figure 2). How were these genes selected? Was the list manually curated or did they use DAVID or another GO software to select angiogenic regulators? 5) How were DMR assigned to genes? Subsection “Clustered intragenic loss of methylation regulates TGFβ family and semaphorin signaling in quiescent endothelial cells”: "As enhancer regions could influence the expression of distant genes, up to three nearby genes were assigned to the dependent DMRs to identify genes likely affected by differential methylation". Please provide reference related to assignation method. 6) The correlation of quiescence-related expression and methylation profiles is an important aspect of this study, since it confirms the hypothesis that the cells' phenotype, and thence the infant to adult transition, is controlled by DNA methylation. Therefore, some of the data in Figure 4—figure supplement 1 should be in the main paper and should be described in more detail. There is a lot of information in this figure, which should be presented and not just briefly described in the Figure legend. Also, Subsection “Clustered intragenic loss of methylation regulates TGFβ family and semaphorin signaling in quiescent endothelial cells”: "these data suggest that vascular quiescence is accompanied by a prominent loss of methylation in intragenic DMR clusters preferentially affecting and regulating the expression of genes involved in the regulation of TGFβ family, semaphorin and NOTCH signaling in this process". Is there a GO analysis showing how these pathways rank compared to others? It is interesting to focus on these pathways, but it should be clear whether these are the top pathways or whether they have been selected because of their functional relevance. 7) EC differentiation and maturation, the acquisition of quiescence and their angiogenic potential are all aspects of overlapping processes; The Authors repeatedly use "angiogenesis" as the opposite of quiescence. The opposite of quiescence is proliferation, and indeed in the early part of the study the Authors measure the proliferation rate of the cells under investigation. But I don't think that it is correct to equate "proliferative" with "angiogenic", given that several stages of angiogenesis do not require proliferation. 8) The data on SMAD 6&7 overexpression (Figure 5, Figure 5—figure supplement 1 and Figure 5—figure supplement 2) is interpreted as confirming a key role for these two in the acquisition of endothelial quiescence. However, over-expression of SMAD6 alone does not affect proliferation, and the combined over-expression results in decreased cell viability. The interpretation of these results should be more cautious. 9) The conclusions are that the TGFb family is critical for the process. But what happened to the STAT pathway which was highlighted in Figure 1? This should be mentioned in the Discussion section. The aim of this revised manuscript from Schlereth et al. manuscript is to discover which molecules drive endothelial cell (EC) quiescence. To achieve this, they compare EC gene expression changes that occur as new born mice progress to adulthood and establish and maintain a quiescent adult endothelium. The group undertake an "-omics" comparison of FACS sorted (CD34+CD31+) lung ECs harvested from suckling mice (8-10dpp) versus those harvested from adult mice (6-8 weeks dpp) mice, including transcriptomic profiling and DNA methylomics. The authors should be congratulated on bioinformatics analysis and interpretation of a large body of genome wide expression data that is certainly correct and gives insights into the adult quiescent endothelial cell state. However, since e Life tends to be read by biologists, the text could be expanded slightly to make it easier for biologists with fewer quantitative skills to assess and follow. The extensive genome-wide unbiased data reveals that components of active canonical TGF β and BMP signaling are down regulated in the adult quiescent state, exemplified by low levels of expression of receptors for TGF β and BMP and low levels of phosphorylated pSmad2/3 and pSmad1/5/8. This is interesting, and consistent with the widely accepted view of TGF β signaling serving in homeostatic regulation of epithelial and endothelial growth. The prediction would be that this signaling pathway would be upregulated when homeostasis is perturbed (e.g. by wounding, damage to endothelium, inflammation) in order to restore quiescence, a phenomenon that has been described extensively in epithelia and to a lesser extent for endothelia, but not addressed in the current study. The major novel finding of the current study is that genes encoding the inhibitory SMADs, Smad6 and SMAD7, are released from the epigenetic suppression that exists in lung ECs of young mice, such that in the adult these genes show extensive DNA hypomethylation at intronic CpG clusters indicative of higher gene expression, and consistent with the observation of higher Smad6/7 transcript levels by RNAseq and TAQMan. Thus, a major difference between lung EC from suckling versus adult mice is that in the former Smad6/7 genes are epigenetically repressed, whereas in the adult excessive Smad6/7 expression suppresses active TGF β/BMP signaling. The authors also show that in brain and heart EC, there too is epigenetic suppression of Smad6/7 in suckling mouse lung EC and release from such suppression in adult lung EC, suggesting that this is a universal rather than tissue specific effect. The manuscript (a) provides a useful resource for individuals interested in analysis of EC gene expression, (b) helps to place into context earlier findings of contextual actions of TGF β on EC, and (c) forms the foundation for further mechanistic studies. The previous reviewers asked for more in vivo validation of data. Although the authors go some way to provide this in Figure 5, the data in this figure is from total tissue lysate not from ECs, and would be include immune cells, epithelial cells and fibroblasts. It would be important to demonstrate that the high Smad6 and Smad7 transcript levels in adult versus young lung ECs are translated in to differential protein levels, either by Western and/or IHC. If not already assessed in the literature or by the authors, future studies should address whether Smad6/7 protein is diminished in EC during pathological angiogenesis? NB Smad6 has at least as high expression in smooth muscle cells and pericytes, so it would be important to differentiate these two populations from EC. We sincerely appreciate the editor´s summarizing assessment of our manuscript. We would also like to thank the reviewers for their constructive and critical comments considering this work to have substantial potential for future studies on vascular maturation but at present lacking significant validation experiments. In a nutshell, the reviewers’ comments may be summarized as “exciting, but premature”. We essentially agree with this assessment. Admittedly, some of the data, particularly in the text of the Results section have not been spelled out in sufficient detail. Yet, when carefully going over the figures, it is clear that the answers to many of the reviewers’ comments are already in the manuscript (see response to specific comments below). From the epigenetics point of view, there is in the recent high-profile literature a lot of correlative work relating transcriptomic changes to epigenetic changes without substantial functional validation. We believe the present study stands out, because we have done such analysis in very close association to an important biological function employing freshly in vivo isolated cells. Based on this analysis, we have prototypically validated one of the most important identified pathways in cellular experiments in vitro and in expression profiling experiments in vivo. The starting point of our study (infant vs. adult EC) was amazingly simple. Yet, with all the vascular transcriptomic work pursued in recent years, this highly relevant biological differential has in no study been pursued – albeit being more than obvious. Along these lines, we do not think that the discovery of a key role of TGFs pathway signaling in vascular maturation is per se not novel. TGFs pathway functions during angiogenesis are through different receptors highly contextual and even many experts would likely be confused to answer if the net outcome of the pathway would in vivo be primarily pro- or antiangiogenic. We therefore consider the discovery of the pathway in the probably most relevant physiological vascular maturation process an important discovery. Likewise, it is obvious from our validation experiments in brain and heart (which has been extended in the revised manuscript) that the overriding process that we have studied is vascular quiescence and not organotypic lung EC differentiation. As spelled out in detail in the response to the individual reviewers’ comments, we have addressed all comments through additional experiments and/or extensive editorial revisions. Importantly, the manuscript has been completely restructured. In doing so, we have taken up the very constructive comments of reviewer #3, who concluded that the original paper focused on two stories, the FOXO/ETS switch and the regulation of the TGFs pathway during vascular quiescence with both of them not being fully developed. We agree. In refocusing the revised manuscript, we removed the FOXO/ETS switch data (on which we will continue to work and will communicate them at a later stage separately when it is more mature), to focus on the systems biology transcriptional and methylome profiling, which has led to the discovery of the TGFs pathway as mechanism of physiological vascular quiescence. We point out towards this end the central role of signaling inhibition by epigenetically-regulated Smad6/7 expression. In line with the addressing of the additional reviewers’ specific comments, we believe that such revised structure gives the manuscript much more coherence and better readability. Along the same lines, as suggested by reviewers #1 and #3, the title of the manuscript has been rephrased to better fit with the content of the study towards: “Genome-wide profiling of endothelial cells identifies TGFß family signaling as key regulator of vascular quiescence”. Whilst the comprehensive approach is interesting and contains valuable information, there are aspects that reduce enthusiasm as the conclusions appear somewhat overstated or unclear. Given that the study is essentially based on sorted cells from one organ, it is unclear whether the gene networks identified truly signify general mechanisms of quiescence or rather relate to maturation of the lung vasculature in particular. For example, it seems possible that the lung vasculature is particular active in immune-related signaling given the strong exposure to pathogens. It is noteworthy that the authors do not state what the pathogen status of the animals is. They were purchase from Taconic, but no other information is provided. The regulation of angiotensin is also interesting as the lung vasculature runs under different pressure regimes compared to the rest of the body. Again, is this lung specific? Some genes that are found would further suggest that not all sequences come from endothelial cells. For example, Notch3 is normally not expressed by EC to my knowledge. The Results section does not contain information how the authors controlled for purity. The Materials and methods section however show that the isolation is not only done by FACS but preceded by dynabead magnetic sorting. Given that the lung tissue develops substantially between the selected stages, it would be important to understand whether the two stages had similar levels of non-EC contamination. The isolation and digestion procedures are bound to be affected differently. This needs to be explained. We sincerely appreciate the reviewer’s overall positive assessment of the manuscript. In the revised manuscript, we evaluated the potential systemic mechanism of quiescence by analysing TGFs family signaling in different organs in more detail. In addition to lung, we have included brain and heart in our analyses, showing the expression of Smad6 and Smad7, the phosphorylation status of receptor-regulated R-SMADs and TGFs family ligand levels (see Figure 5 and Figure 5—figure supplement 1). These data demonstrate that although ligand levels are high in adult tissue, R-SMAD phosphorylation is mostly decreased in EC, which might be due to Smad6 and/or Smad7 expression resulting in TGFs family signaling being repressed in young adult compared to infant tissues. Notably, cellular experiments of enforced expression of SMAD6 and/or SMAD7 in HUVEC demonstrated reduced R-SMAD phosphorylation upon ligand stimulation (Figure 5C), thereby confirming a certain state of resistance in EC expressing inhibitory SMADs. The reviewer also asked if it would be possible to modify methylation experimentally. This is definitely an interesting suggestion. Yet, we don’t necessarily consider this of major relevance for the present scope of the study. Technically, CRISPR-Cas9-based epigenome technology has recently become available for the precise perturbation of the activity of specific regulatory elements (Klann et al., 2017; Hilton et al., 2015). We are planning on performing such experiments in the future but believe that this would be beyond the scope of the present manuscript. As mentioned by the reviewer, mice were purchased from Taconic. Upon arrival, mice were kept in “Individually Ventilated Cages” (IVC) to maintain the health status as declared be Taconic as “Taconic Health Standard: Murine Pathogen Free™”. This information is now included in the manuscript (Subsection “Mice”). The purity of isolated EC was validated after sorting as shown in Figure 1—figure supplement 1B, which is now explicitly stated in the main text (subsection “Endothelial transcriptomic changes during acquisition of vascular quiescence”). Furthermore, we included the results of additional EC population characterization experiments in Figure 1B and Figure 1—figure supplement 1C. 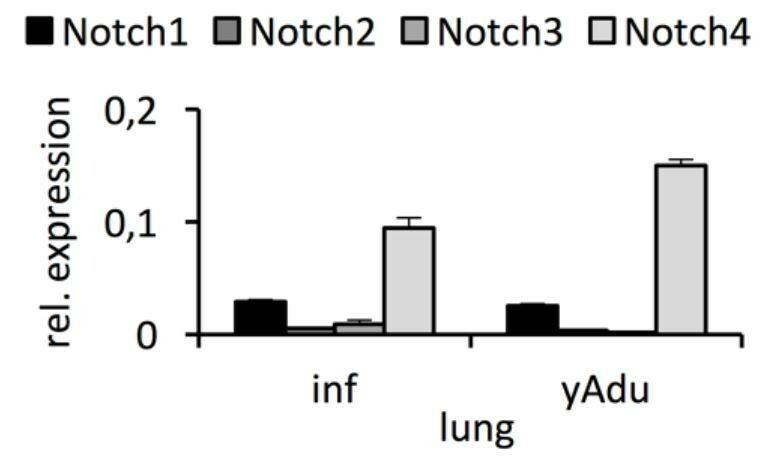 As the expression of Notch3 was specifically mentioned by the reviewer, we performed qPCR to validate the expression to be clearly detectable in infant lung EC (Figure 2—figure supplement 1A). As the RNA-seq data pointed to different expression level of the different Notch receptors, we aimed at getting a more precise picture of the expression of the different Notch receptors in EC during acquisition of vascular quiescence. Therefore, we also validated Notch1, Notch2 and Notch4 expression by qPCR in independent biological EC samples. This analysis confirmed the higher expression of Notch1 and Notch4 (Δ Ct [Notch1 – Actin] = 5.4 ± 0.4, Δ Ct [Notch4 – Actin] = 3.8 ± 0.6) compared to Notch2 and Notch3 (Δ Ct [Notch2 – Actin] = 8.2 ± 0.9, Δ Ct [Notch3 – Actin] = 8.1 ± 2.0). The results of these analyses are shown in Author response image 1. Expression of Notch receptors in lung EC. qPCR analysis was performed in independent biological samples. n≥3; mean ± SD..
We sincerely appreciate the reviewer’s assessment of the manuscript. We fully agree with the reviewer and apologize for not citing the mentioned paper. This has been remedied in the revised manuscript. The Mouillesseaux et al., 2016 reference has been included in the Introduction as well as in the Results section. The reviewer doubts our historical reference that SMAD6 and SMAD7 have been identified as vascular SMADs. Both molecules are, of course, ubiquitously expressed. Yet, the title of the original Topper et al., 1996 reference reads: “Vascular MADs: Two novel MAD-related genes selectively inducible by flow in human vascular endothelium”. And despite their ubiquitous expression, the Gimbrone group was probably not far off as portraying them as vascular SMADs considering that they exert particularly prominent vascular functions, e.g., as reflected by the phenotype of the knockouts. In revising the manuscript, we have spelled this our more clearly (Discussion section). The study takes a novel approach to the question of quiescence. Transcription profiling identifies over 2000 genes differentially expressed in newborn vs young adult; GO analysis identifies genes involved in multiple families including cell cycle, and proliferation analysis of EC from various organs using EdU and Ki567 profiling shows decreased EC proliferation in the adult. Figure 1 shows two of the pathways that may be involved in this phenotypic switch, namely the JAK-STAT pathway and the TGFb pathway. Given that the focus of the study is on quiescence, it would be important to provide the list of genes involved in cell cycle regulation. The network analysis in Figure 1—figure supplement 2 is not very helpful; it could be removed and replaced by small selected networks with each gene labelled. We sincerely appreciate the reviewer’s overall positive assessment of the manuscript. We fully agree with the reviewer that the regulation of cell cycle genes is of particular interest in a study focusing on the transition of angiogenic EC to quiescent EC. We have therefore included a detailed gene list in the revised manuscript (Figure 1—source data 1). In addition, we validated the differential expression of three cell cycle regulatory genes in independent biological replicates of lung, brain and heart EC by qPCR (Figure 1D and Figure 1—figure supplement 1E). We also agree with the reviewer that the statement of the regulation of angiogenic pathways is overstated. Following the reviewer’s advice, the revised manuscript focusses on TGFs family signaling and further validates TGFs family signaling molecules as key regulators of vascular quiescence. Correspondingly, the title has been modified as follows: “Genome-wide profiling of endothelial cells identifies TGFß family signaling as key regulator of vascular quiescence”. Furthermore, the interactome network analysis has completely been moved to the supplementary data (Figure 1—figure supplement 2) and we decided to leave out the FOX/ETS switch (please see also response to editor’s comment). As correctly noted by the reviewer, the absence of prominent regulation of VEGF/VEGFR signaling during acquisition of vascular quiescence needs further discussion. Therefore, the discussion now includes a new section dealing with this finding (Discussion section). In addition to the complete re-phrasing of the discussion, we also extensively revised the Results section to include more detailed descriptions, specifically in the part describing the DNA methylation analysis. For instance, we included statistics demonstrating a significant increase of CpGs with >80% methylation level in adult EC compared to infant EC (p=6.87x10-6) (Figure 3A) (subsection “Vascular quiescence is accompanied by a prominent loss of DNA methylation at intronic enhancer regions”). EPU (enhancer-promoter units) were among the genomic regulatory features that helped to further characterize the quiescent-specific DMRs (Figure 3F). These units were defined by the Ren lab (Shen et al., 2012) “to gain a better understanding of enhancer/promoter organization”. They “assessed the correlation of the chromatin state at enhancers and polII occupancy at promoters for each possible pair of elements along a chromosome” and “observed that co-regulated promoters and enhancers tend to form clusters with variable sizes.” Thereupon, they “developed an algorithm to detect these local clusters, defined as enhancer–promoter units (EPUs).” We believe that the re-structuring and re-phrasing of the manuscript has substantially improved the readability and understanding of the presented findings. We sincerely appreciate this comment about presenting protein expression data of SMAD6 and SMAD7. As the reviewers, we felt the need to not only present RNA expression but also protein expression data. We tried hard to identify SMAD6 and SMAD7 in immunoblots or immunostainings. We tested towards this end several antibodies from different companies in immunoblots (Abcam, Life Technologies, R&D systems, Santa Cruz, Σ; published one from Cell Signaling Technologies #9519 was not available anymore). However, when we depleted SMAD6 and SMAD7 by shRNA, we could not detect a decline in protein bands that would reflect the qPCR data (specific and reliable Taqman assays) generated from exactly the same samples (Author response image 2) suggesting that the detected bands do not necessarily reflect endogenous SMAD6 or SMAD7, respectively. Yet, when we exogenously expressed SMAD6 in HUVEC the corresponding antibody detected a distinct band in the expected samples. At the height of this specific band no endogenous protein could be detected in our hands. Furthermore, even though qPCR data proved a high exogenous SMAD7 expression this could not be mirrored in immunoblots. In summary, the SMAD6 antibodies detected the exogenous SMAD6 but not the endogenously expressed protein and SMAD7 was not detected at all by any of the employed antibody in our hands. Similarly, immunostainings of SMAD6 or SMAD7 did not result in specific staining in our hands. HUVEC were either depleted for (A, B) or overexpressing (C, D) SMAD6 and/or SMAD7. Both, shRNAs or overexpression constructs were introduced by lentiviral transduction followed by selection with puromycin (P) or neomycin (N). Panel A and C represents Taqman-based qPCR data and panel B and D the corresponding protein expression data from the same treatment replicates. SMAD6 antibody from Life Technologies (PA1-41026), SMAD7 antibody from R&D systems (MAB2029). We thank the reviewer for this constructive comment and apologize for the confusion. In fact, the upregulation of Vegfa (shown in heatmap of Figure 2A) is the only significantly differentially expressed VEGF pathway molecule that we identified. The Kdr expression difference between infant and young adult EC was neither in RNAseq data nor in qPCR data significant. Moreover, neither Reactome overlap analysis nor IPA upstream growth factor analysis identified the VEGF/VEGFR signaling pathway as being significantly differentially regulated. To avoid confusion, we deleted the mentioned sentence in the Results section, included a more detailed figure legend of Figure 2A, and rephrased the sentence in the Discussion section into “Since the expression of the primary VEGF signal transducing receptor Kdr/Vegfr2 was neither in RNA-seq nor in qPCR data significantly changed […]”. We thank the reviewer for this comment and apologize for not phrasing the correlation of transcriptomic and epigenetic data precisely enough. The reviewer is correct when stating that hypomethylation does not guarantee gene upregulation at the moment of analysis and refers to Sema6a as a bona fide example. This gene is significantly repressed in adult compared to infant mice while harboring multiple hypomethylated DMRs in adult EC. This suggests that the gene is repressed by other epigenetic mechanisms (histone modification, lincRNA interaction, etc.). Yet, when taking the complete genome-wide profiles into account, we see an excellent correlation of hypomethylation of the gene locus and gene induction in adult EC (see also overlap analysis shown in Figure 4F). For clarification, the corresponding sentences have been rephrased to better reflect the type of analysis (enrichment analysis) that was performed by using Gene Set Enrichment Analysis (GSEA) to correlate gene expression profiles without setting thresholds that might introduce bias (see subsection “Clustered intragenic loss of methylation regulates TGFβ family and semaphorin signaling in quiescent endothelial cells”). We thank the reviewer for this constructive comment. The mentioned sentence from the discussion refers to the overlap analysis shown in Figure 4F. Relating to this figure panel, we state in the Results section that “we identified an increasing overlap of transcriptome and epigenome, when scoring genes on the basis of intragenic DMRs and even more so when scoring based on clustered DMRs (Figure 4F). This correlation implies that genes with intragenic clusters of loss of methylation DMRs are likely to be induced during acquisition of vascular quiescence, while those genes with clustered gain of methylation DMRs are likely to be repressed.” Certainly, we cannot exclude that for some genes this correlation does not hold true. The inhibitory SMADs, Smad6 and Smad7, were most interesting for us as (1) they contained large clusters of hypomethylated DMRs in adult EC, and as (2) inhibition of TGFß family signaling was obvious from the transcriptome analysis. Thus, the methylome data gave us a hint how the inhibition of TGFß signaling might be achieved in adult endothelium. We thank the reviewer for this critical comment and gladly elaborate on this in more detail. We focused on the TGFß family signaling pathway as both genome-wide profiling approaches – independently – revealed a prominent regulation of relevant signaling molecules during the acquisition of endothelial cell quiescence. On the one hand, RNA-seq analysis demonstrated differential expression of multiple TGFß signaling molecules and upstream analysis of the complete set of significantly regulated genes revealed TGFß1 as the most significantly inhibited growth factor in adult EC (see subsection “TGFß family signaling is inhibited in quiescent EC”). On the other hand, the functional annotation of the genes next to differentially methylated regions (DMRs) identified by tagmentation-based WGBS similarly pointed towards a significant enrichment of TGFß family signaling molecules containing DMRs (see subsection “Clustered intragenic loss of methylation regulates TGFβ family and semaphorin signaling in quiescent endothelial cells”). Notably, we identified large clusters of hypomethylated DMRs in some genes and the genomic loci of Smad6 and Smad7 contained some of the largest clusters (see subsection “Clustered intragenic loss of methylation regulates TGFβ family and semaphorin signaling in quiescent endothelial cells”). As these two genes were also identified in the transcriptome analysis to be significantly repressed during transition to quiescence, we focused further validation studies prototypically on SMAD6 and SMAD7 in human endothelial cells. We are aware of the fact that this study led to the identification of genome-wide profiles that can and will serve as starting point for many further studies. The reason why we mentioned the JAK-STAT signaling pathway without further validation studies was that it further specified the “immune system regulation” identified in the REACTOME overlap analysis of upregulated genes in adult EC (see Figure 1C). The specification of a pathway relevant in immune system regulation and at the same time EC quiescence was not obviously anticipated and therefore we included these interactome results. We considered these findings of interest for the prospective reader of the manuscript since only few previous publications have referred to a role of this pathway in EC quiescence biology. As advised by the reviewer, the section referring to the pathways identified to be enriched in the interactome analysis was revised to include more information (see subsection “Endothelial transcriptomic changes during acquisition of vascular quiescence”). Furthermore, we validated the upregulation of Stat1 during the acquisition of vascular quiescence in independent biological samples (Figure 2—Figure supplement 1A). We thank the reviewer for this suggestion. As mentioned by the reviewer, the visualization of this kind of analysis is rather difficult. We included the interactome scheme to give the reader an impression of this kind of protein-protein interaction analysis. As suggested by the reviewer, we now also included cluster analysis of the quiescence-dependent interaction network which results in the identification of sub-communities of genes (see Figure 1—figure supplement 2C). These clusters were furthermore associated with biological function when enriched pathways could be identified. The corresponding results and methods section have been adjusted correspondingly (see subsection “Endothelial transcriptomic changes during acquisition of vascular quiescence” and subsection “Interactome analysis”). We thank the reviewer for this question. To establish this list, we made use of both curated gene sets of consortia listed in MSigDB and also manually selected additional molecules that are known to impact angiogenesis. We thank the reviewer for careful inspection of the functional annotation analysis performed on the differentially expressed genes. The pathways shown in Figure 1—Source data 1 were derived from the interactome analysis which is based on protein interactions established from a seed set of proteins (differentially expressed genes during endothelial cell quiescence). In contrast, upstream analysis identifies regulatory molecules that impact the expression of a given gene (like for example a common upstream transcription factors that regulate a diversity of genes). Therefore, the pathways identified by means of these two different analyses do not necessarily overlap. Yet, TGFß family signaling was identified independently in both analyses. The reason why we further focused on TGFß family signaling has been outlined in more detail in comment 1 of reviewer #2. We apologize for not mentioning the tool used for the assignment of genes to the DMRs. This has been included in the revised manuscript (subsection “Clustered intragenic loss of methylation regulates TGFβ family and semaphorin signaling in quiescent endothelial cells”). 6) The correlation of quiescence-related expression and methylation profiles is an important aspect of this study, since it confirms the hypothesis that the cells' phenotype, and thence the infant to adult transition, is controlled by DNA methylation. Therefore, some of the data in Figure 4—figure supplement 1 should be in the main paper and should be described in more detail. There is a lot of information in this figure, which should be presented and not just briefly described in Figure legend. Also, Subsection “Clustered intragenic loss of methylation regulates TGFβ family and semaphorin signaling in quiescent endothelial cells”: "these data suggest that vascular quiescence is accompanied by a prominent loss of methylation in intragenic DMR clusters preferentially affecting and regulating the expression of genes involved in the regulation of TGFβ family, semaphorin and NOTCH signaling in this process". Is there a GO analysis showing how these pathways rank compared to others? It is interesting to focus on these pathways, but it should be clear whether these are the top pathways or whether they have been selected because of their functional relevance. We thank the reviewer for this comprehensive comment. As suggested, we reviewed Figure 4 and Figure 4—figure supplement 1 thoroughly and added more detailed descriptions to the Results section. Figure 4 now contains two new panels that have previously been depicted in the supplement and that highlight the identification of DMR clustering in the DNA methylation analysis (new Figure 4B and C). Correspondingly, we added more information in the Results section to increase understanding and readability (see subsection “Clustered intragenic loss of methylation regulates TGFβ family and semaphorin signaling in quiescent endothelial cells”). The sentence that the reviewer is citing summarizes the functional annotation analysis of the genes closest to DMRs. It refers to the tables shown in Figure 4A listing the top gene sets that overlap with the GREAT gene list, which assigned genes to the DMRs identified during the acquisition of vascular quiescence. The gene set list is sorted according to FDR in ascending order. This analysis implies a significant overlap of (1) the genes next to loss of methylation DMRs with TGFß and semaphorin signaling, and (2) the genes closest to gain of methylation DMRs with Notch and developmental signaling. This has now been stated more clearly in the Results section (see subsection “Clustered intragenic loss of methylation regulates TGFβ family and semaphorin signaling in quiescent endothelial cells”). We fully agree with the reviewer that the opposite of endothelial cell quiescence is not just angiogenesis. Yet, we have in the manuscript consistently used the term “quiescence” to refer to the non-proliferative, resting state of adult endothelial cells in comparison to actively proliferating infant endothelial cells (as also obvious from the functional validation shown in Figure 1B and corresponding Figure 1—figure supplement 1D). In this respect, endothelial cell proliferation may be considered the most robust readout of the process of angiogenesis. 8) The data on SMAD 6&7 overexpression (Figure 5 and supplementary) is interpreted as confirming a key role for these two in the acquisition of endothelial quiescence. However, over-expression of SMAD6 alone does not affect proliferation, and the combined over-expression results in decreased cell viability. The interpretation of these results should be more cautious. We apologize for the confusion. It was always our aim to interpret the results obtained from in vitro validation experiments adequately. Therefore, we stated that the decreased cell viability was only obvious upon prolonged culturing (see subsection “Epigenetically-regulated SMAD6 and SMAD7 control vascular quiescence”). Moreover, we are aware of the fact that SMAD6 and SMAD7 do not alone mediate endothelial cell quiescence. Yet, the data presented in Figure 5 suggest that they are regulating important processes (proliferation and migration) involved in this process. The wording of the title was consequently not only referring to SMAD6 and SMAD7 but rather to the TGFß family signaling pathway at large. To avoid confusions generated by the title, we used the opportunity to change the title to better reflect the studies content: “The transcriptomic and epigenetic map of vascular quiescence in the continuous lung endothelium”. This title aims at raising the readers interest and guiding her/him to the abstract that contains a detailed data summary (please see also response 3 to reviewer 3). We thank the reviewer for these positive comments, and the specific suggestions to further improve the readability of the manuscript. In fact, the reviewer’s comments mostly pointed in this direction and helped us to work on the general comprehensibility. Therefore, we believe that the revised manuscript is easier to read and to understand for the broad audience of the journal and not only to the specialist reader. We thank the reviewer for this comment on the role of SMAD6/7 in disease. Obviously, we were curious if published data would reveal important roles of the mentioned genes in pathological angiogenesis. Some studies have implicated SMAD6 and SMAD7 as important molecules in the regulation of TGFβ family activity in human diseases. For example, most cancer studies point towards a tumor suppressive function of SMAD6, as SMAD6 negative cancer show poor survival compared to SMAD6 positive cancer (Mangone et al., 2010; Osawa et al., 2004). In line with this, SMAD6 has been demonstrated to be downregulated in lung adenocarcinoma tissue compared to normal controls (Frullanti et al., 2012). Notably, the repression of both, SMAD6 and SMAD7 in tumors has been contributed to epigenetic silencing by promoter or gene body CpG hypermethylation (Bjaanaes et al., 2016; Hu et al., 2014; Mullapudi et al., 2015). Yet, these data are generated from whole tumor/organ tissue not differentiating between the different cell populations. There is also one study investigating monocrotaline-induced pulmonary arterial hypertension rat model (disordered proliferation of EC) that showed a reduction in Smad6 and Smad7 expression (Morty et al., 2007). Future work in our lab will consequently include pathology-related experiments in SMAD6/7 ECKO mice. We would like to acknowledge the excellent technical support of Stella Hertel and Benjamin Schieb (H.G.A. laboratory) as well as Oliver Mücke, Monika Helf and Marion Bähr (C.P. laboratory). We thank the Flow Cytometry Core Facility and the Central Animal Laboratory, German Cancer Research Center (DKFZ), for providing excellent services. We thank the High Throughput Sequencing unit of the Genomics and Proteomics Core Facility (DKFZ) for providing excellent library preparation, sequencing and QC analysis services (RNA-seq QC and alignment by Christopher Previti). We thank the Light Microscopy Core Facility (DKFZ) for providing instruments and excellent macro generation by Damir Krunic. We thank Lidia Mateo (IRB Barcelona) for help with the EC maturation network representation. Animal experimentation: All mice were handled according to the guidance of the Institute and as approved by the German Cancer Research Center (No. DKFZ305). © 2018, Schlereth et al.